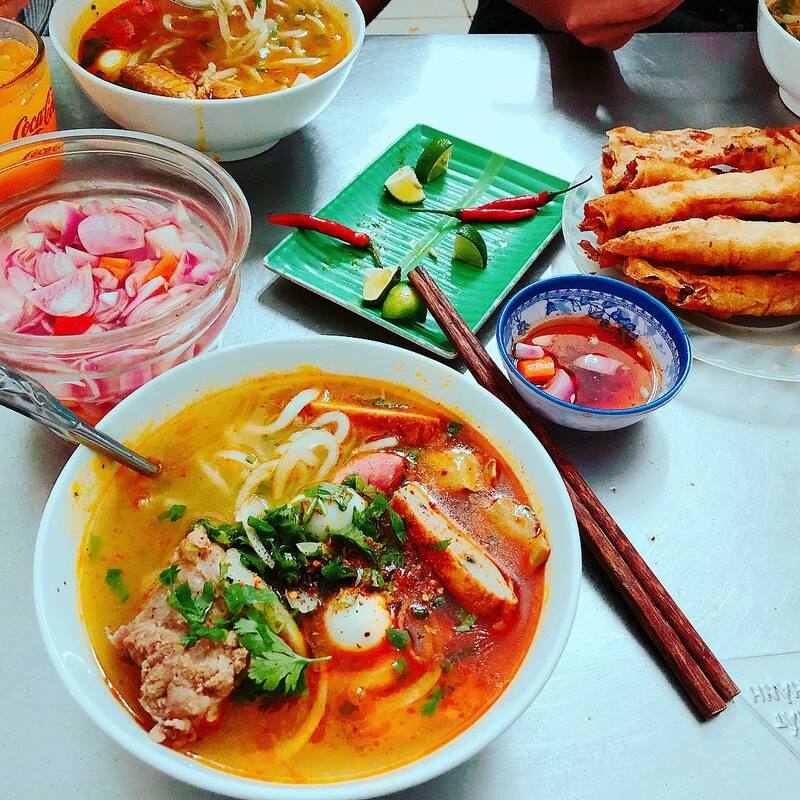 Tourists come to Vietnam for many different reasons: their curiosity about the spectacular natural wonders, the simplicity in applying for a visa, or, above all, the need to explore the delicious Vietnamese traditional cuisine that is definitely within their budget. 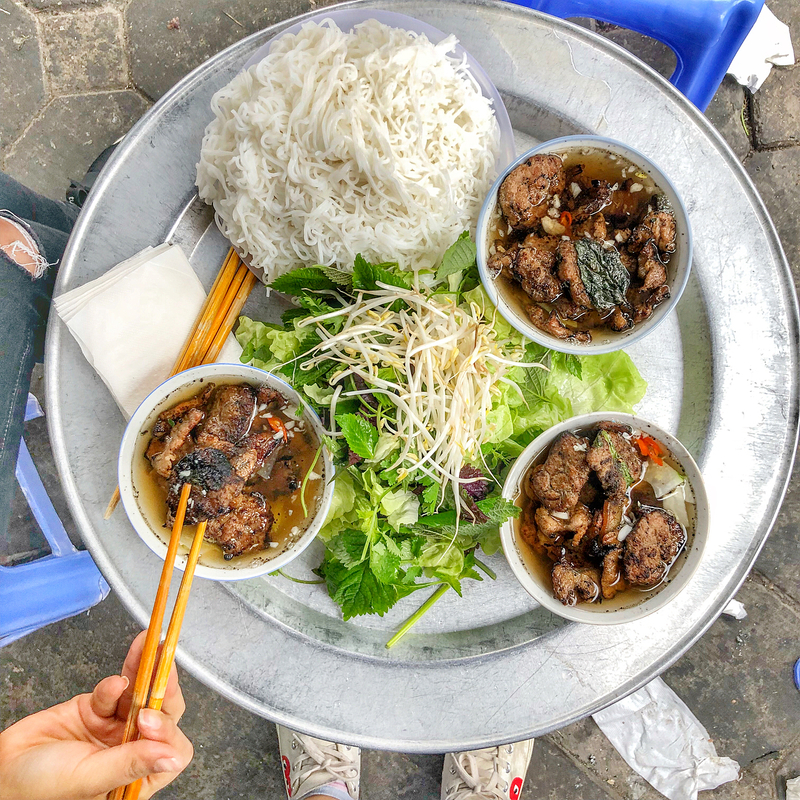 Vietnamese food varies by regions, from North to South, but finding the best ones to eat doesn’t seem to be that easy. 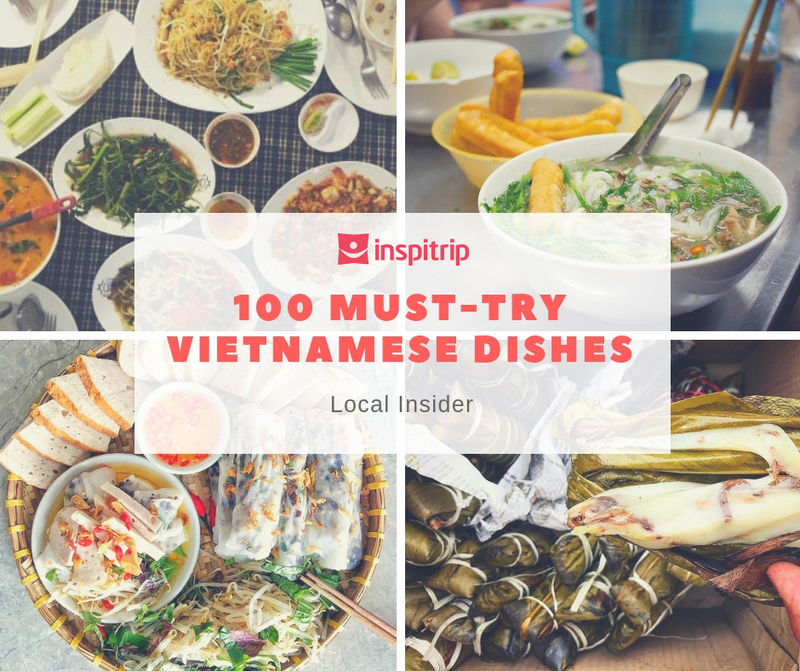 Here are top 100 Vietnamese dishes that we recommend – an ultimate guide to the Vietnamese food. 13. Cha Ca La Vong: more fish! 15. 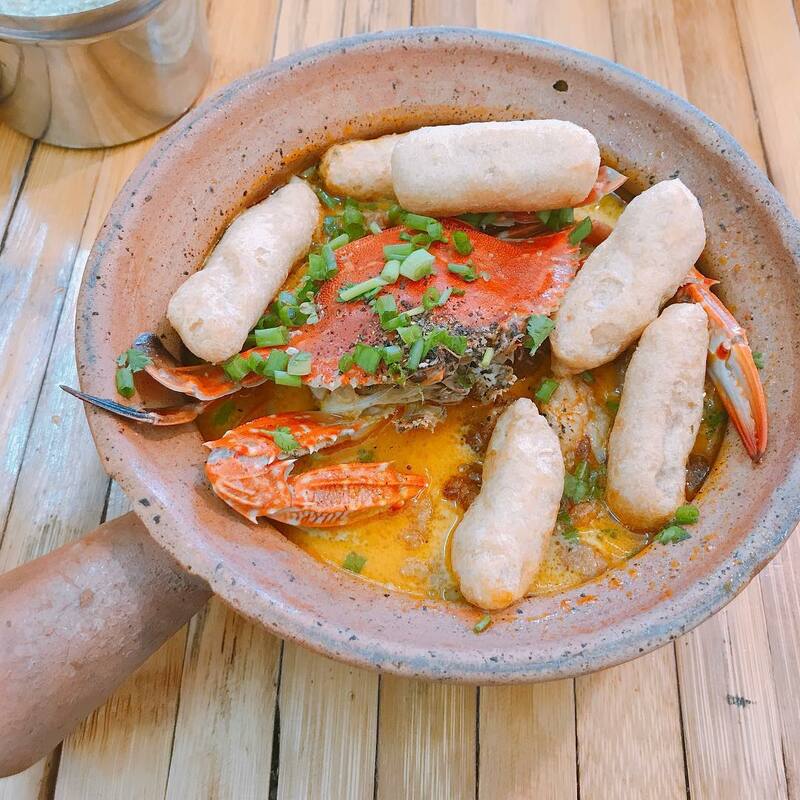 Banh Da Cua Hai Phong: how crab can be turned into tasty soup! 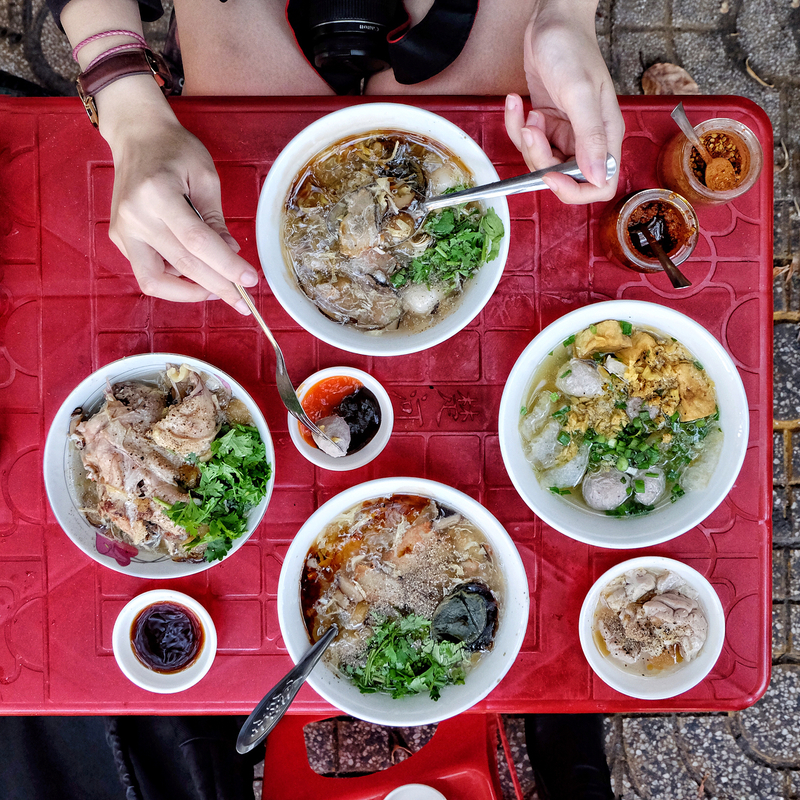 Phở – the unique brand that comes to our minds when we think Vietnam, and is considered to be one of the top world dishes. 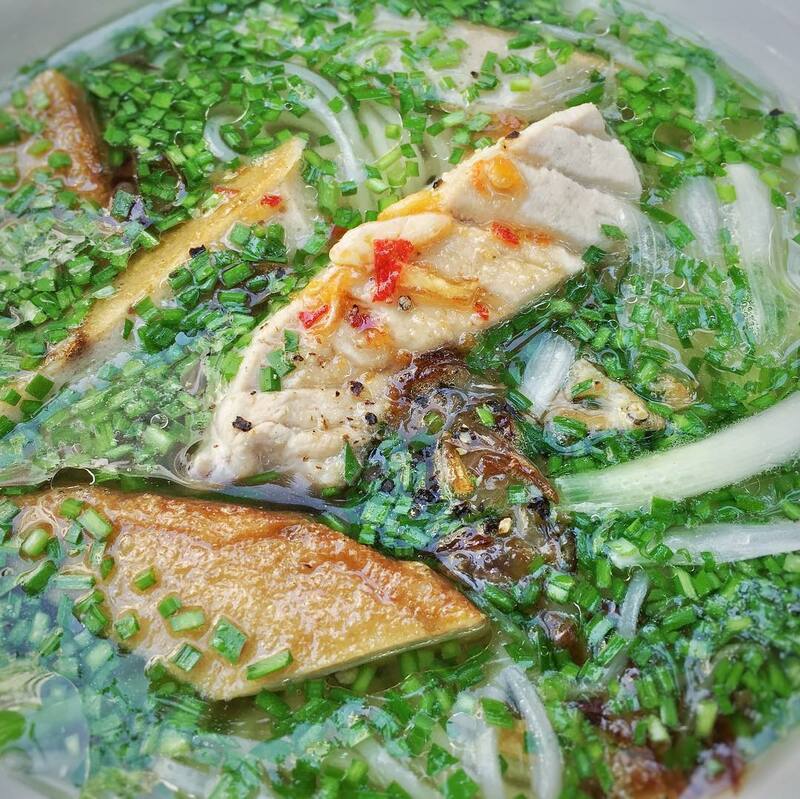 Almost all parts of the country offer Pho, and the taste differs by regions. 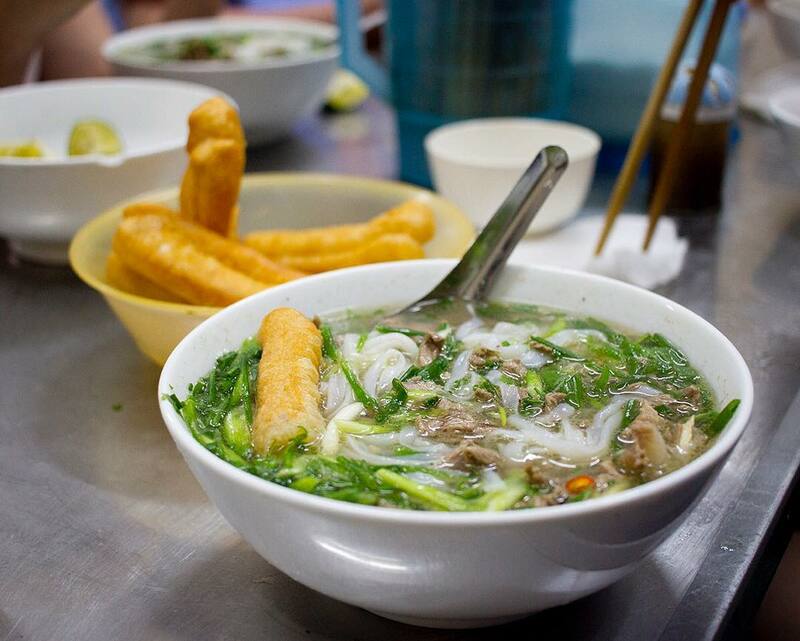 Pho in the Northern part of Vietnam has a stronger and saltier taste. Vietnamese people often eat Pho with crullers, with a cup of iced tea for breakfast. The thing that makes a Pho restaurant stand out from the other ones, would probably be the tastiness of the soup. Banh Cuon is made of a thin layer of rice flour, then rolled with ground pork and some other ingredients. You can’t eat Banh Cuon without a dipping sauce and herbs. 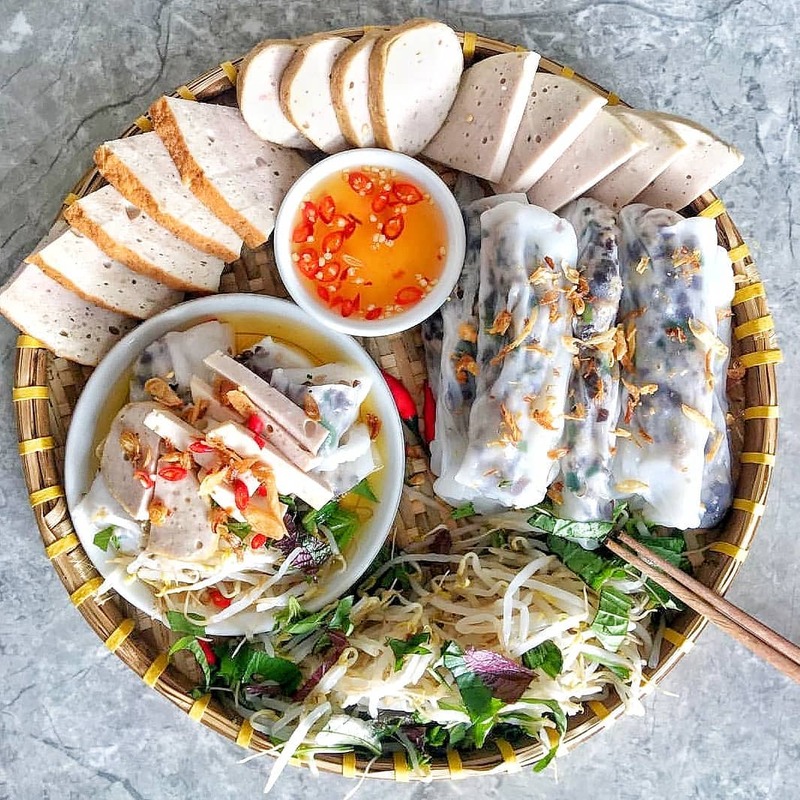 The freshness of these herbs and the tastefulness of the dipping sauce are the keys that make these rolled cakes special to us Vietnamese people. 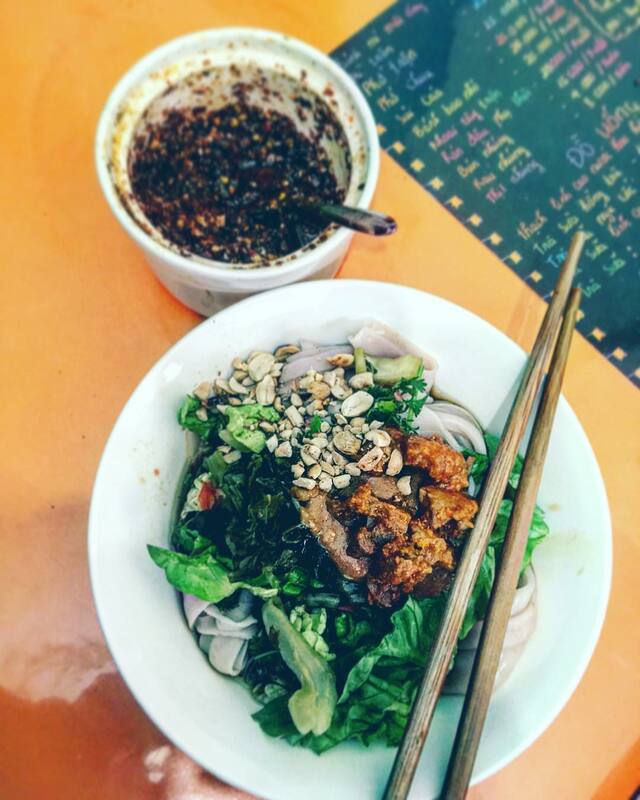 In Hanoi, there’s a Bun Cha restaurant where former US president Obama used to dine in with chef Anthony Bourdain and both really enjoyed it. 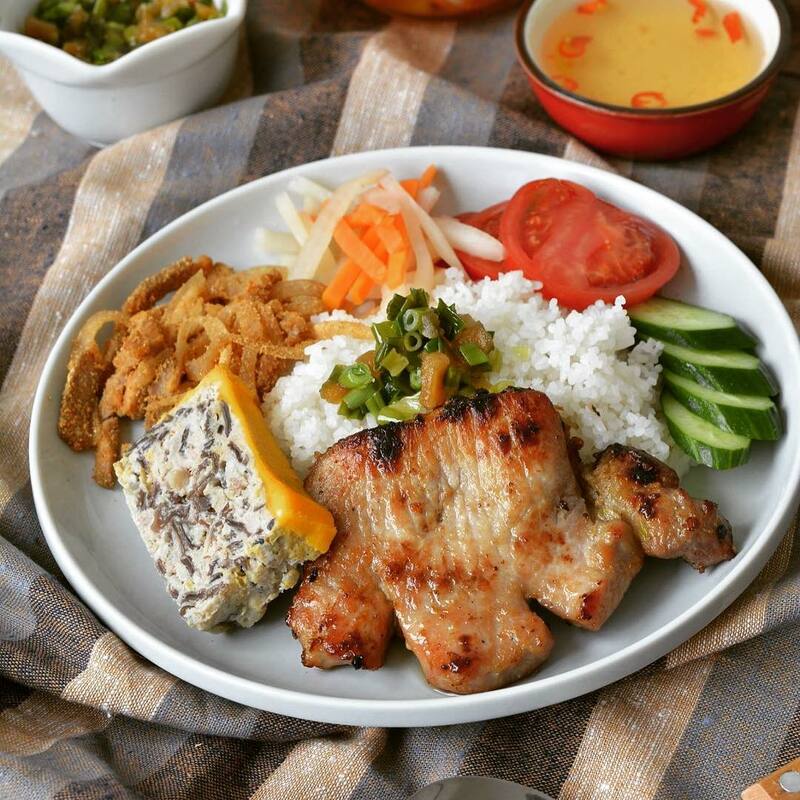 Bun Cha is cooked with grilled pork rice vermicelli, and dipped with dipping sauce and side dishes such as pickles and herbs. 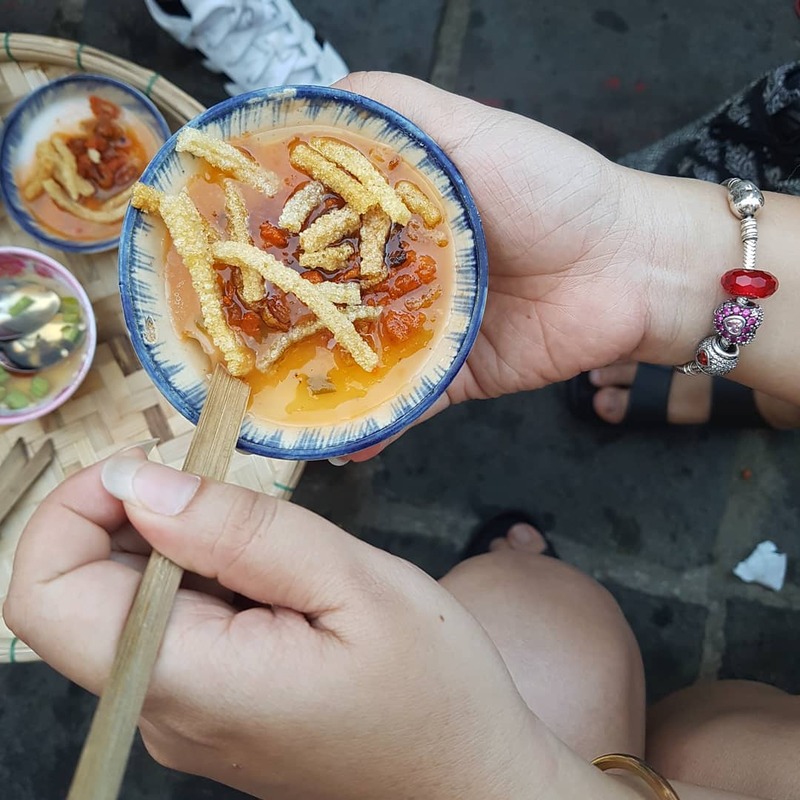 Join food tour to grab a bite of all the tasty food in Vietnam with Inspitrip now! The process of making Bun Thang requires a lot of preciseness and skillfulness of the person who cooks it. 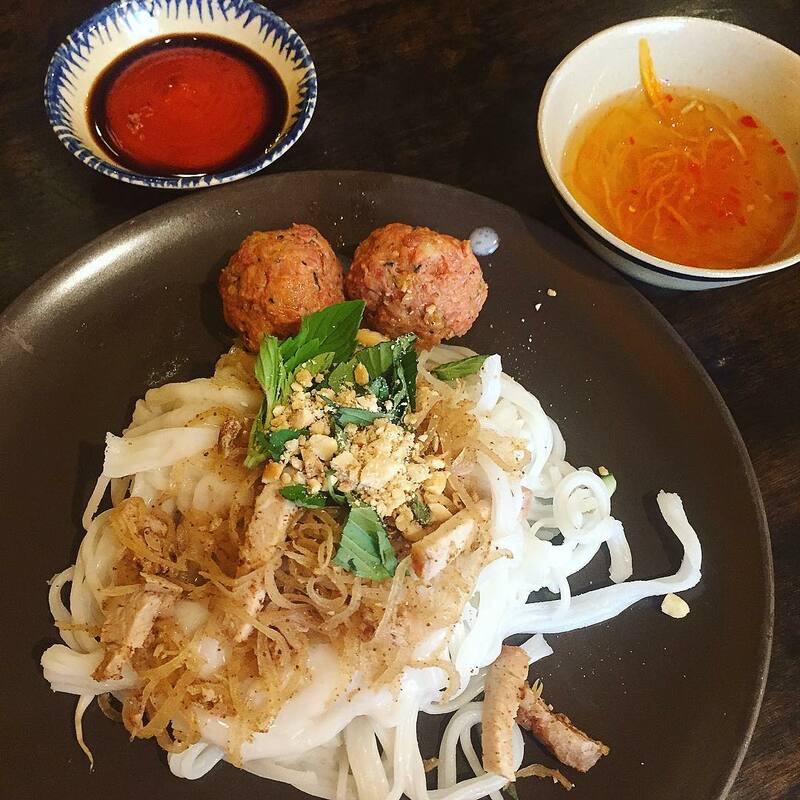 Bun Thang is made of more than 20 ingredients, making this Vietnamese dish just so unforgettable to the eaters. 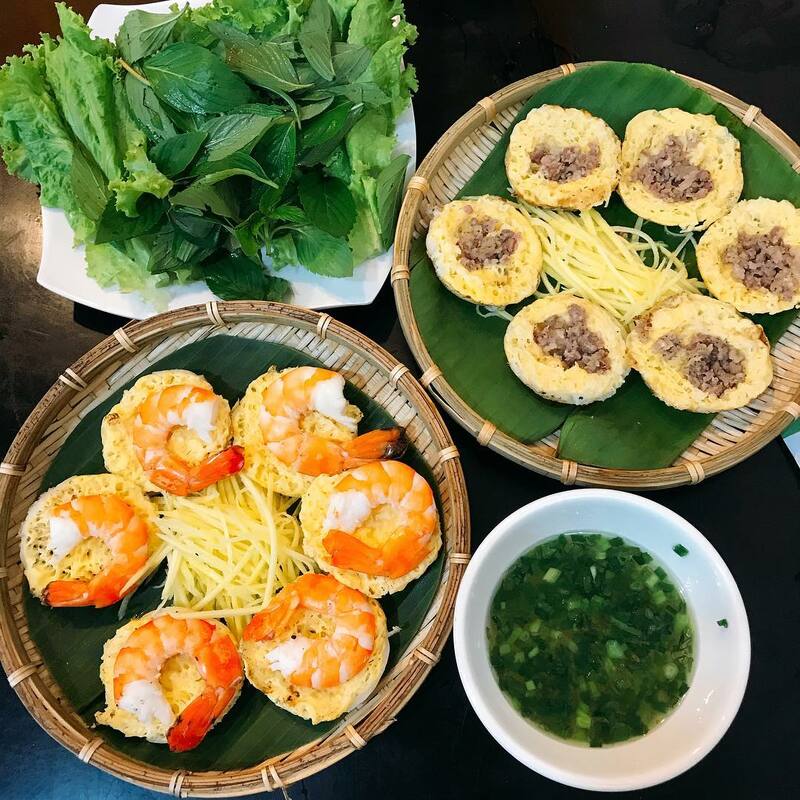 Banh Dau Xanh is one of the specialties of Hai Duong City – the midpoint between Hanoi and Hai Phong City. Banh Dau Xanh is made of natural green bean powder, giving the dish a very pure scent, especially when served with hot green tea. 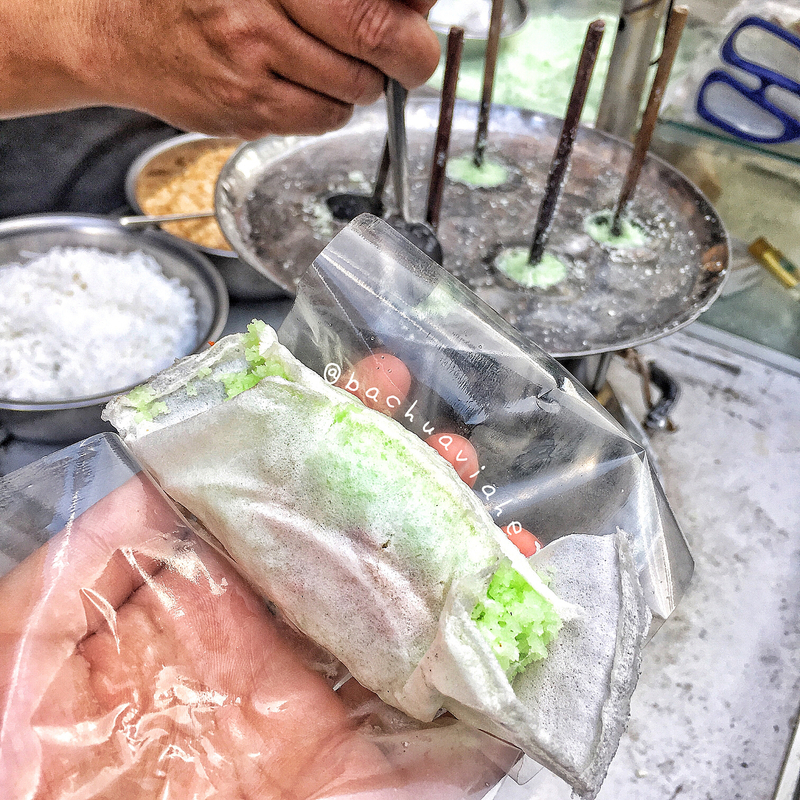 Banh Phu The is a traditional dessert treat, filled with green bean paste, some coconut rice, lotus seeds, and other sweeteners. 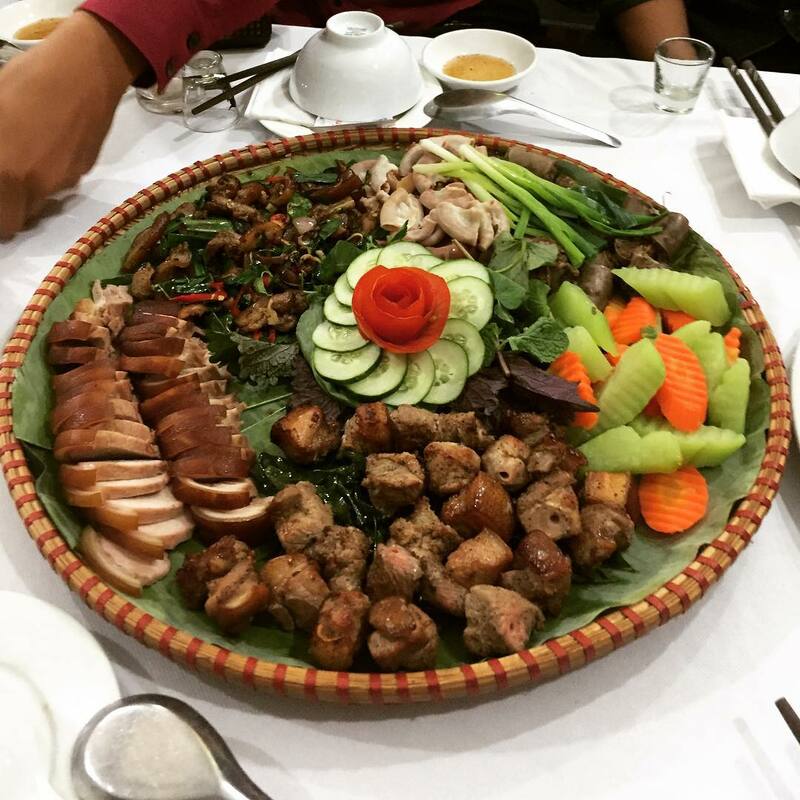 This special kind of goat meat, is traditionally made in Ninh Binh. The people living here have an exceptional way of cooking goat meat that can make it extremely tasty and crispy. 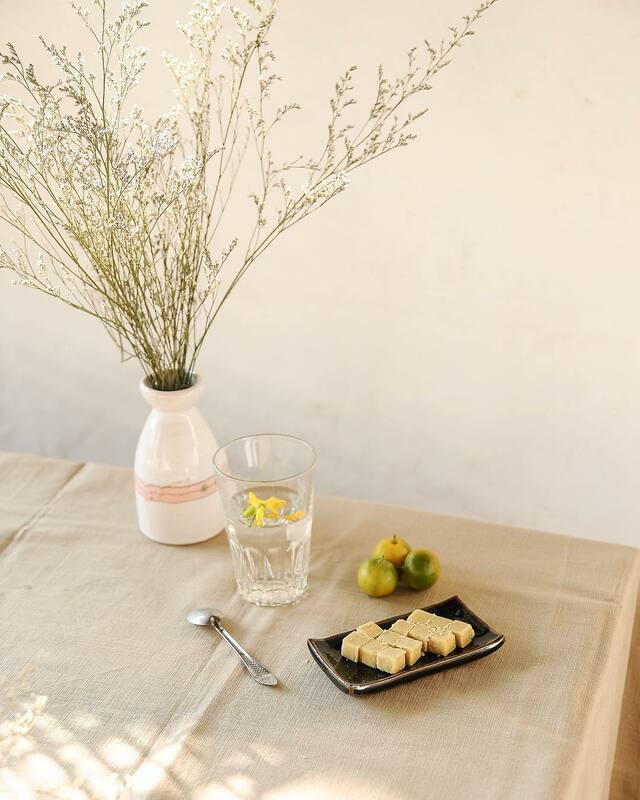 Thit chua is made by the Muong – one of the minority groups in the North of Vietnam. 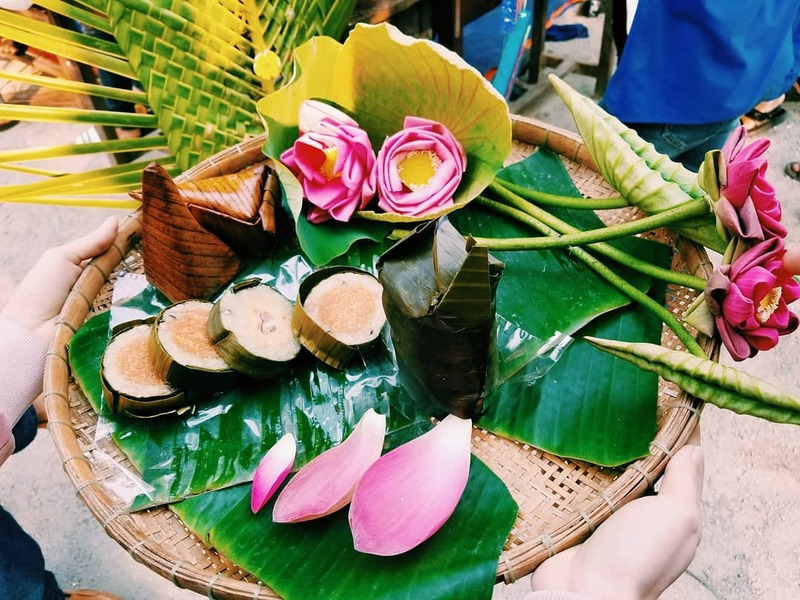 They make Thit chua by fermenting pork with roasted rice powder, then wrapped with banana leaves, or bamboo tubes. 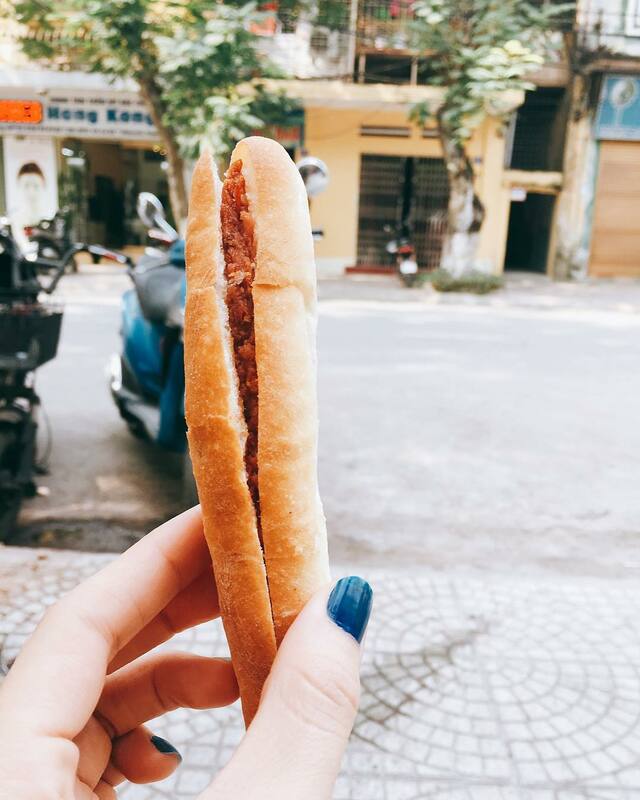 Banh my cay, meaning spicy sandwich, is a specialty in Hai Phong. Unlike other traditional Banh My, Banh My Cay is thin and short, and is filled with pate, and some spices such as chili sauce an pepper. Just like Pho, Nem Ran – Spring Rolls – appear in every area of the country, but taste different by regions, especially the fillings. 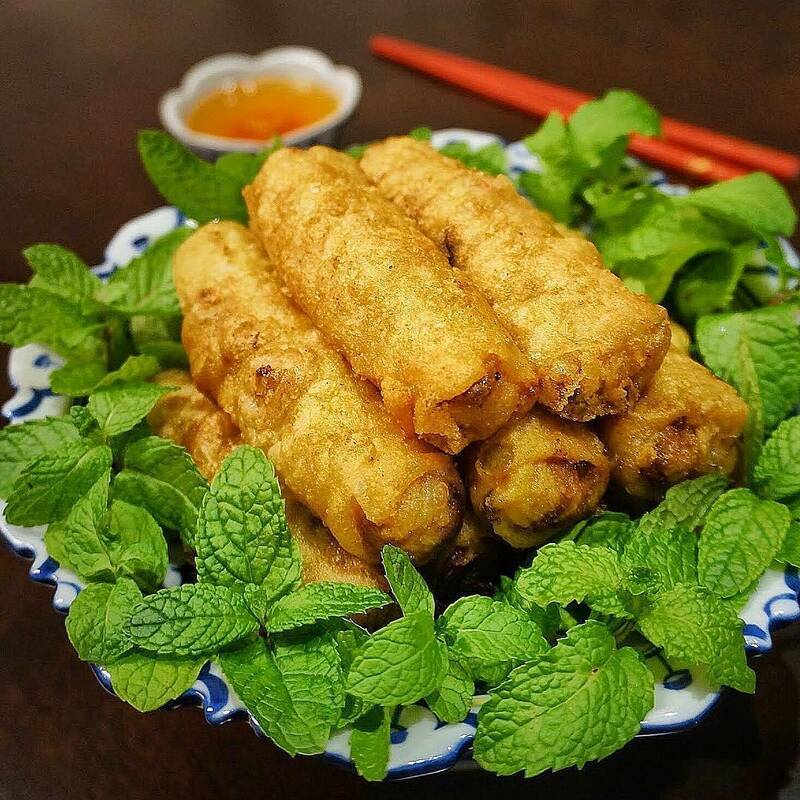 Spring Rolls are mostly cooked during Tet holiday, and best served with dipping sauce and herbs. Cha Muc is made from squid paste, then fried until golden. 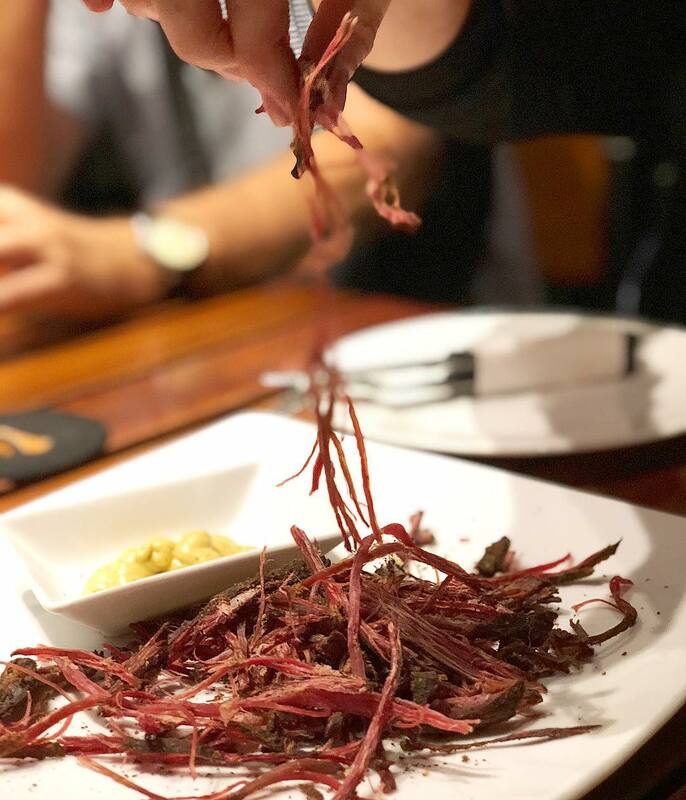 You can find Cha Muc anywhere in Vietnam, but probably the most delicious one would be the one in Ha Long, because squids in here are carefully picked to make the patties, and are grinded by hands. 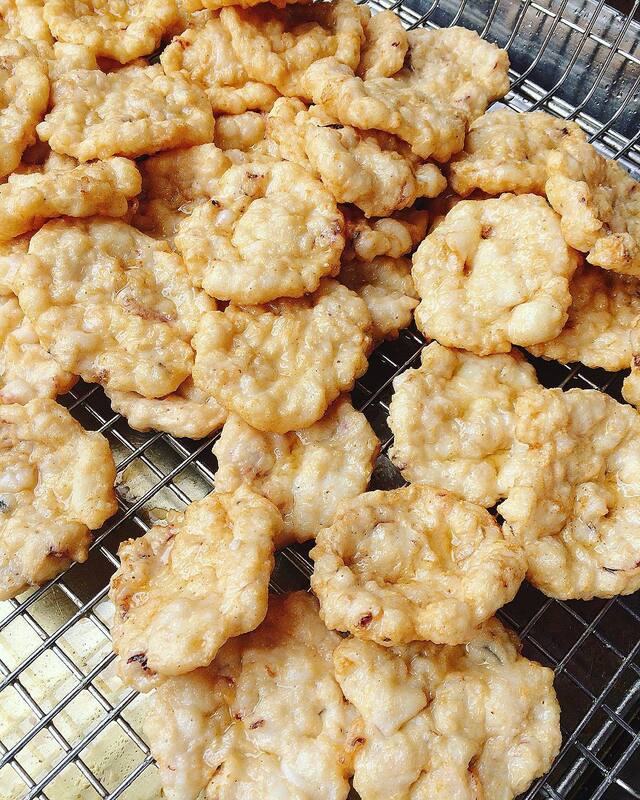 Cha Ca La Vong is another kind of fried patties, but these ones are made from fish (hemibagrus) paste. These patties are well marinated before being grilled, then deep fried until golden. 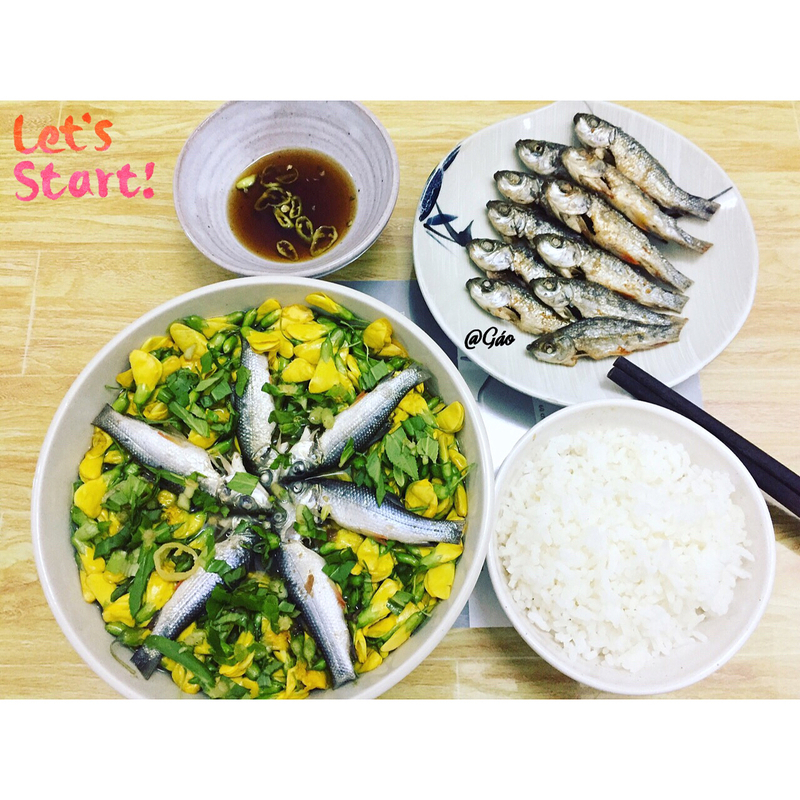 This dish is often served with Mam Tom (shrimp paste). 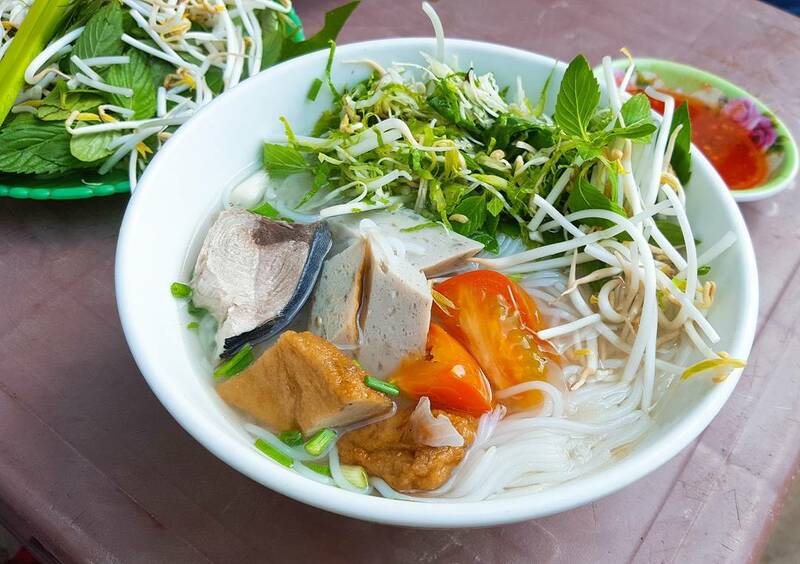 Hai Phong is the city famous for various dishes, including Bun Ca. Bun Ca is fried fish with rice vermicelli, making the fish taste very crispy and tasteful at the same time. Banh Da Cua is another specialty in Hai Phong, made from crab meat, fried chopped meat, shrimps, bean sprouts, bok choy, and herbs. The good thing about Banh Da Cua is the sweetness and freshness of the crab soup. 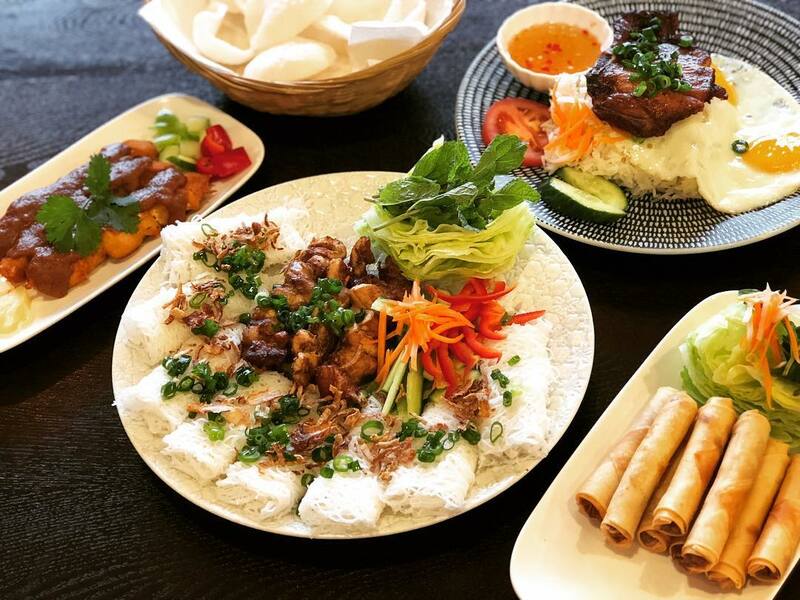 Having been considered to be the “peasant” food, Banh Duc has a wide range of variation. 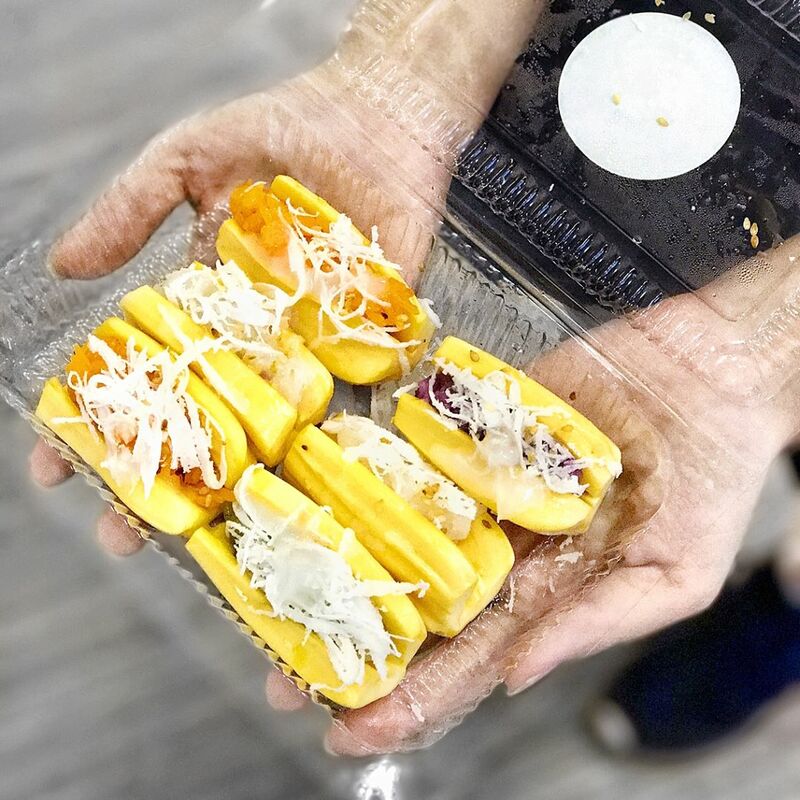 Starting with a base made of rice powder, Banh Duc is twisted with different toppings like peanuts, coconut milk, mussels, etc. Originated from Moc village, this kind of rice vermicelli soup is topped with grounded meatball and an Asian fungus called woodear. Imagine a cool and jelly-like meat that melts in your mouth. It’s going to be an unforgettable experience. 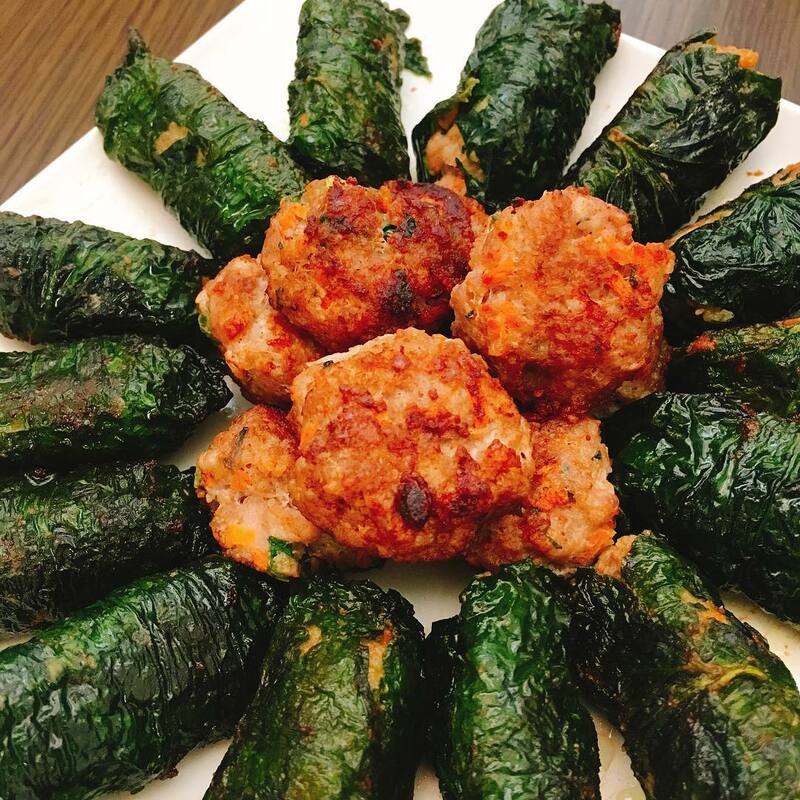 Simply a mixture of minced pork and spices all wrapped in piper lolot leaf, Cha La Lot has a signature smoky smell that is so unforgettable. 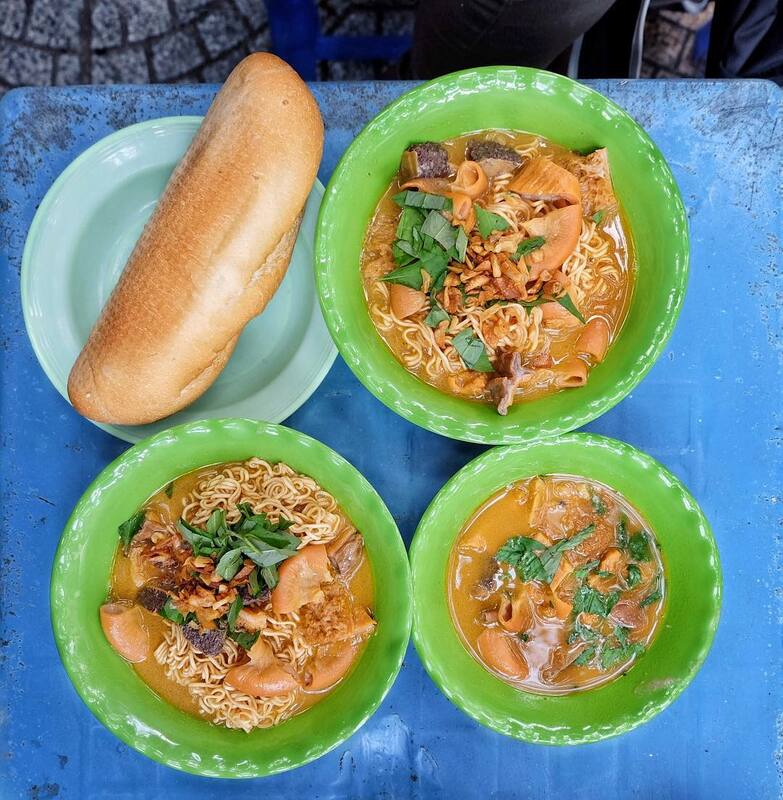 You can mostly find Bun Dau Mam Tom in Hanoi, especially around the Old Quarter. 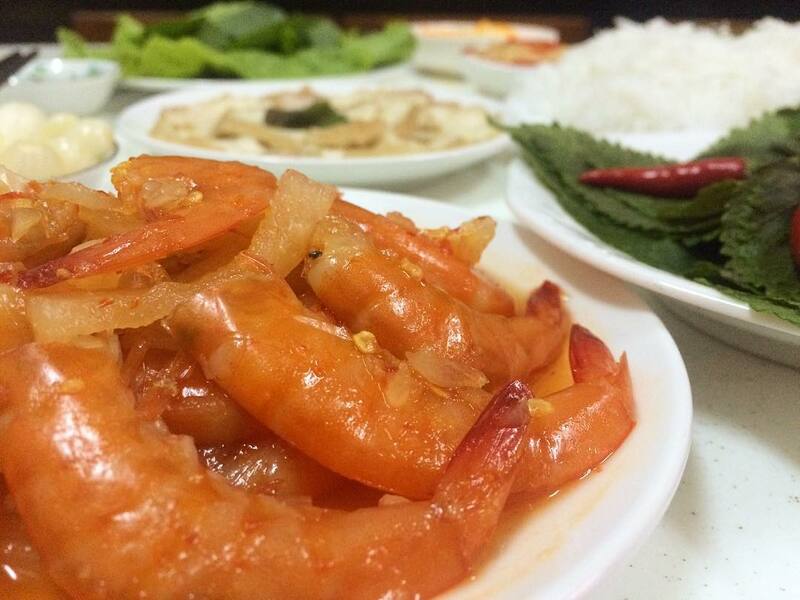 The shrimp paste is the important factor that determines the taste of the dish. 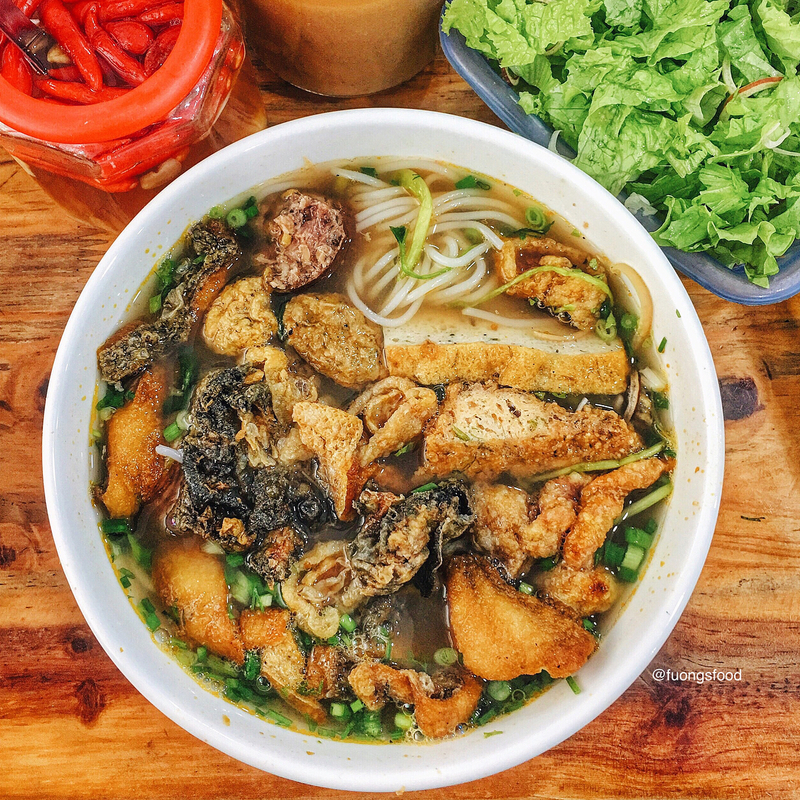 Bun Dau Mam Tom involves rice vermicelli, fried tofu, boiled pork, and herbs. 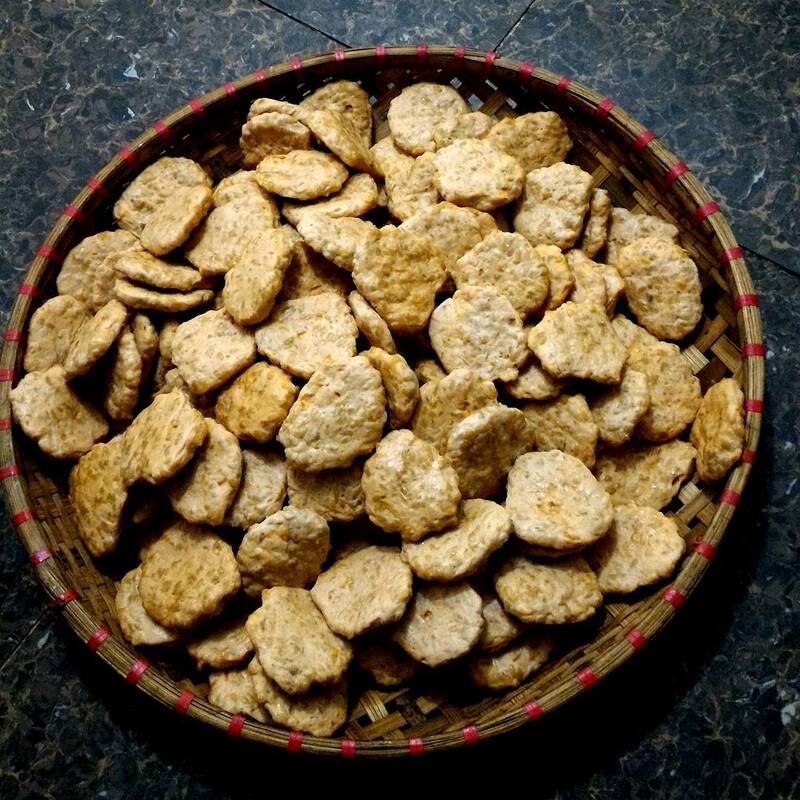 Com Lam are usually made in some mountainous areas in the Northern part of Vietnam (Sapa, Son La, or Lao Cai). The rice is cooked in a bamboo tube, and grilled under high heat, giving the cooked rice a comforting smell of bamboos. 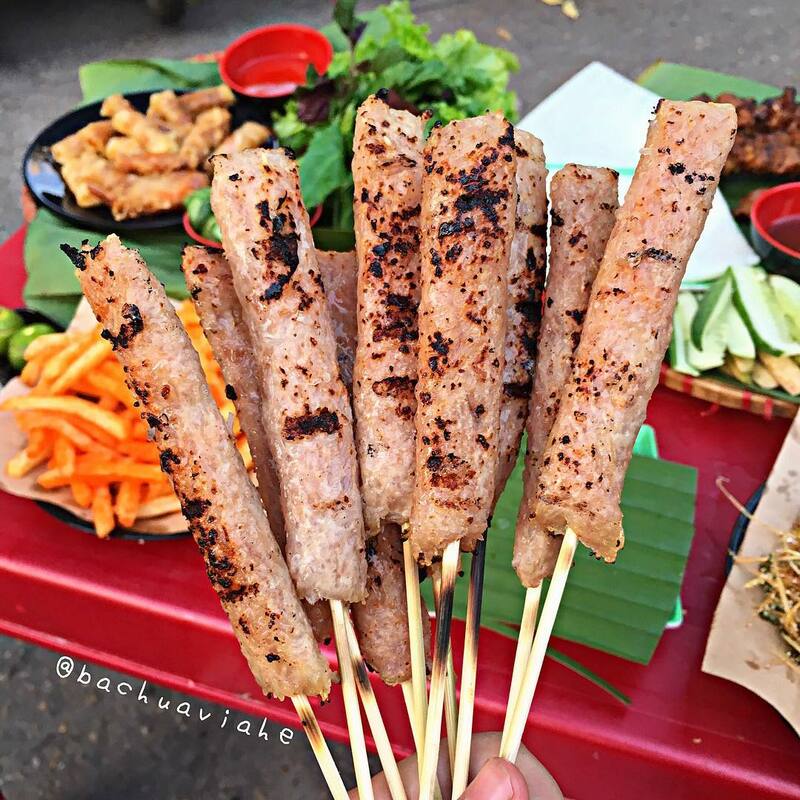 Nem Chua Nuong is made by grilling fermented pork. 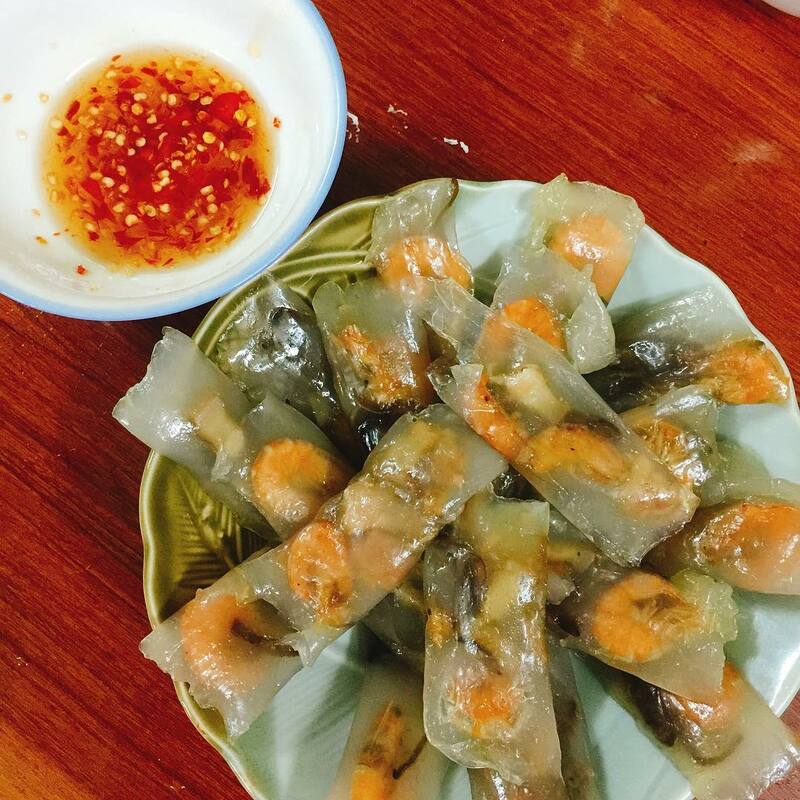 We often have Nem Chua Nuong with chili sauce and herbs, or roll them in thin rice papers. 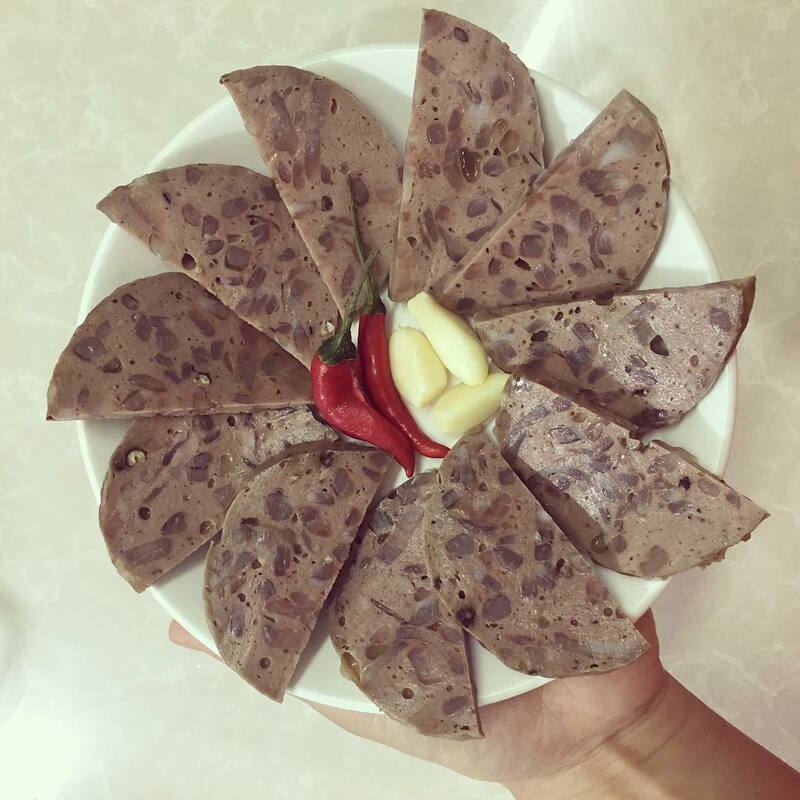 Che Con Ong is often cooked on the 1st day of the month in Lunar Calendar. The goal is to keep it as sticky and soft as possible. 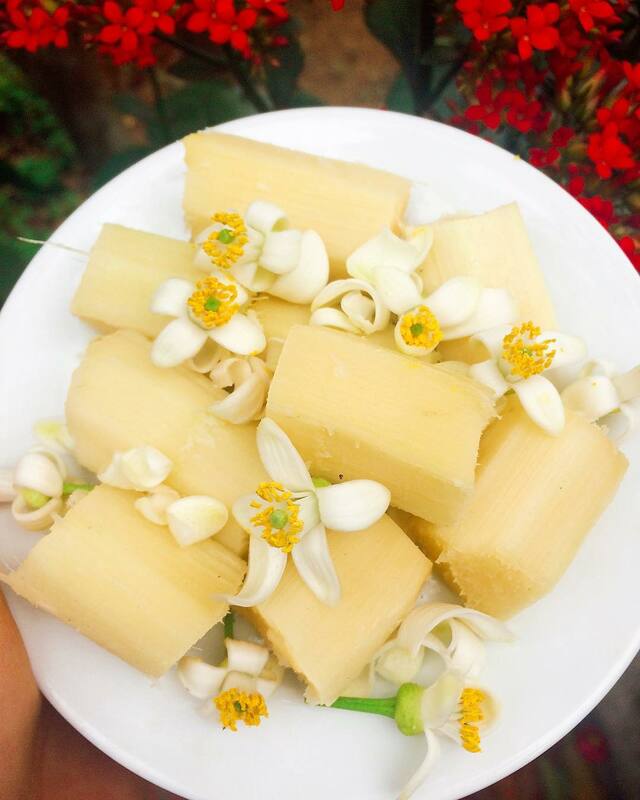 The ambrosial smell of sugar cane marinated with pomelo flowers is just so enduring. This kind of dessert are often had with a cup of hot tea. 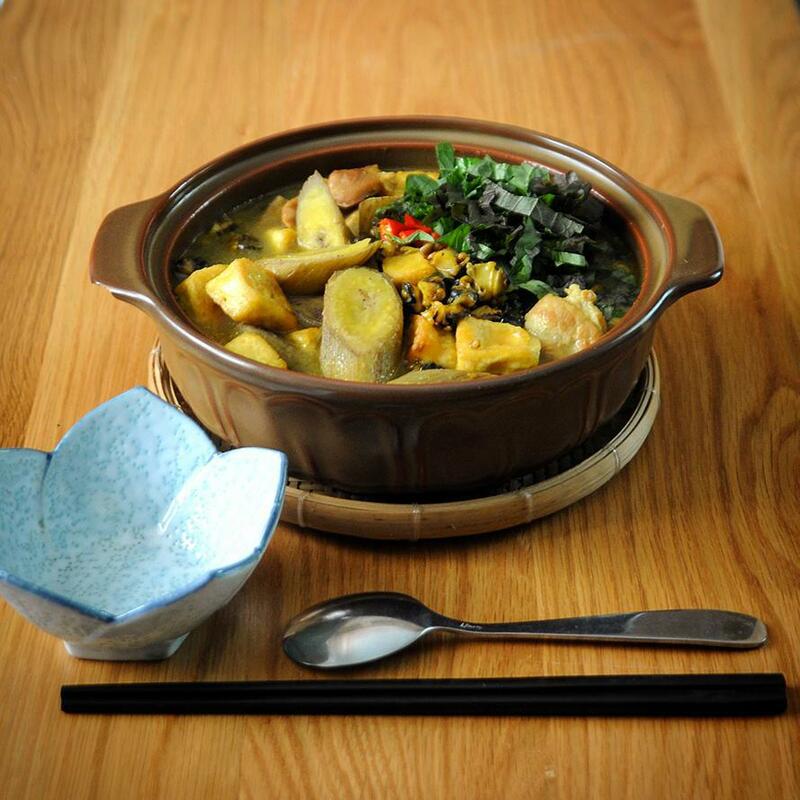 Oc Nau Chuoi Dau is topped with snails, raw bananas, fried tofu, perilla, cumin powder, and other herbs. This dish best goes with rice vermicelli. Tiny pieces of jackfruit are rolled with sticky rice, then topped with coconut rice and crushed peanuts. Banh Goi looks like fried dumplings, filled with ground pork, mushrooms, and fungus. The sour taste of Pho Chua Bac Ha are enjoyed by a lot of people visiting the mountainous areas of the North of Vietnam. It’s the combination of rice paper, lean pork, herbs, peanuts and sour soup. Considered to be one of the specialties in the mountainous area, this veal dish is the top order dish by the tourists. 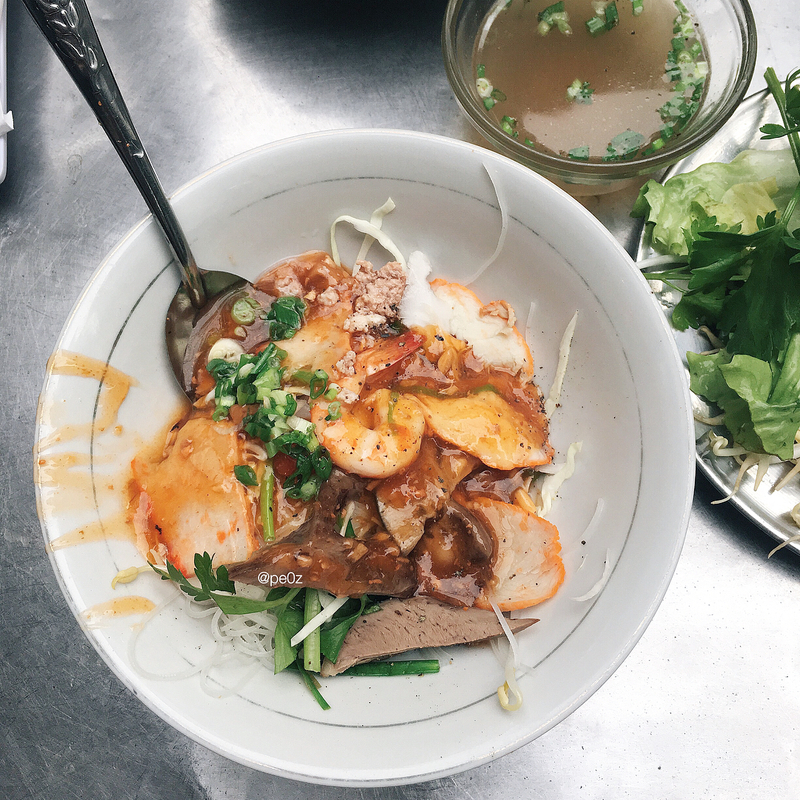 This heavenly dish is a specialty in Tuyen Quang. The sweet, sour and a little bit spicy aroma of the sauce, with the freshness of the fish is just the best combination ever. You can find this buffalo meat in Son La, Lao Cao, or Ha Giang, mostly in the mountainous areas. Thit trau gac bep is a bit chewy, and best served with corn wine. Another specialty in the mountainous area that is served with corn wine. The process of making this dish is very complicated and requires delicacy. 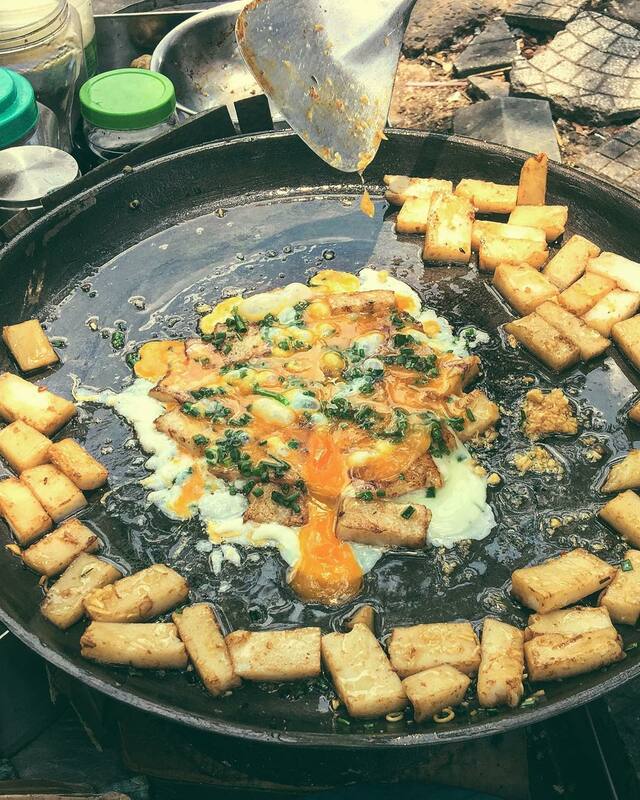 Pieces of lean pork are grilled on wood stove, and served in many ways. 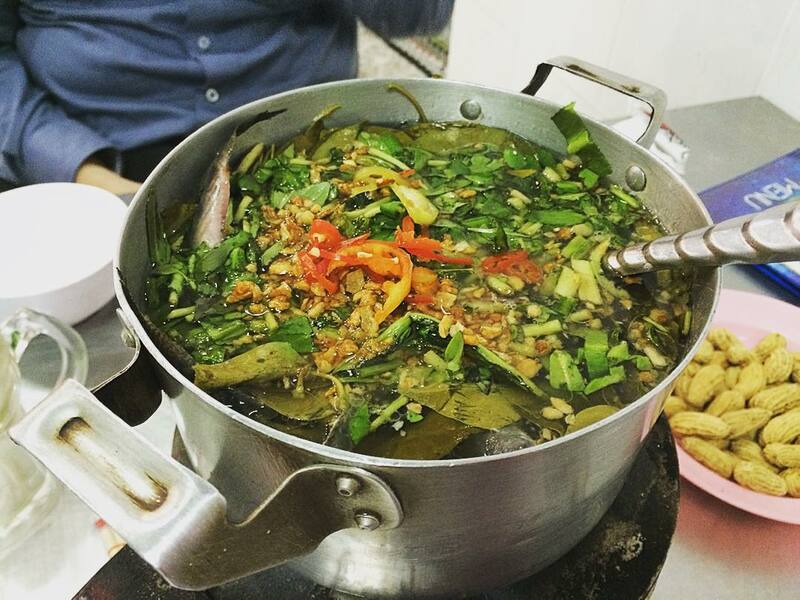 Mi Quang is considered to be a signature dish of the middle part of Vietnam. Mi Quang often goes with chicken, peanuts, and grilled rice cakes. 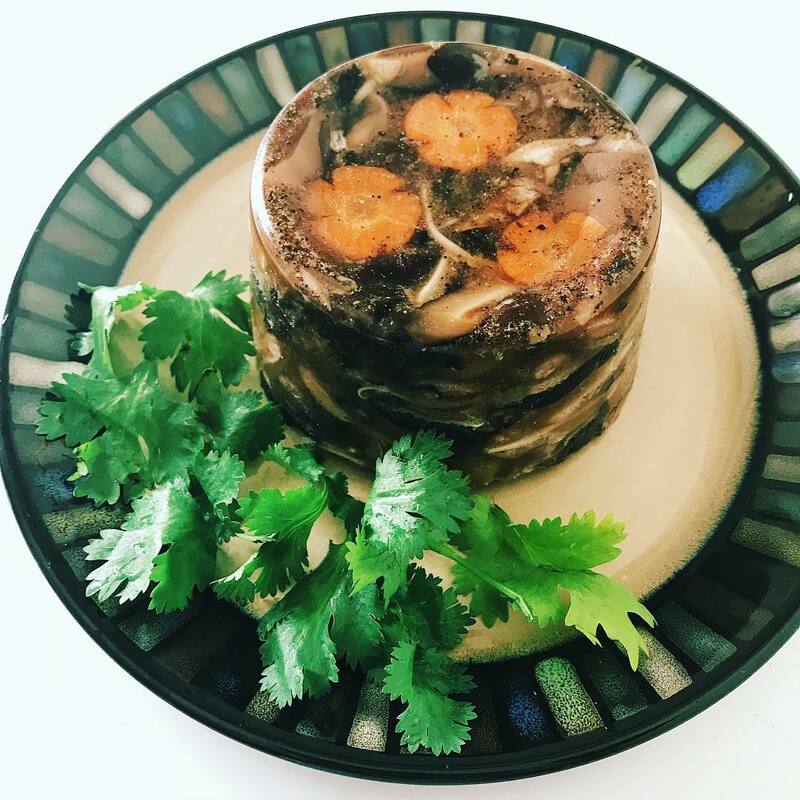 These ingredients are mixed altogether, creating the most unique and exclusive taste of the traditional cuisine that is hard to be found anywhere else. 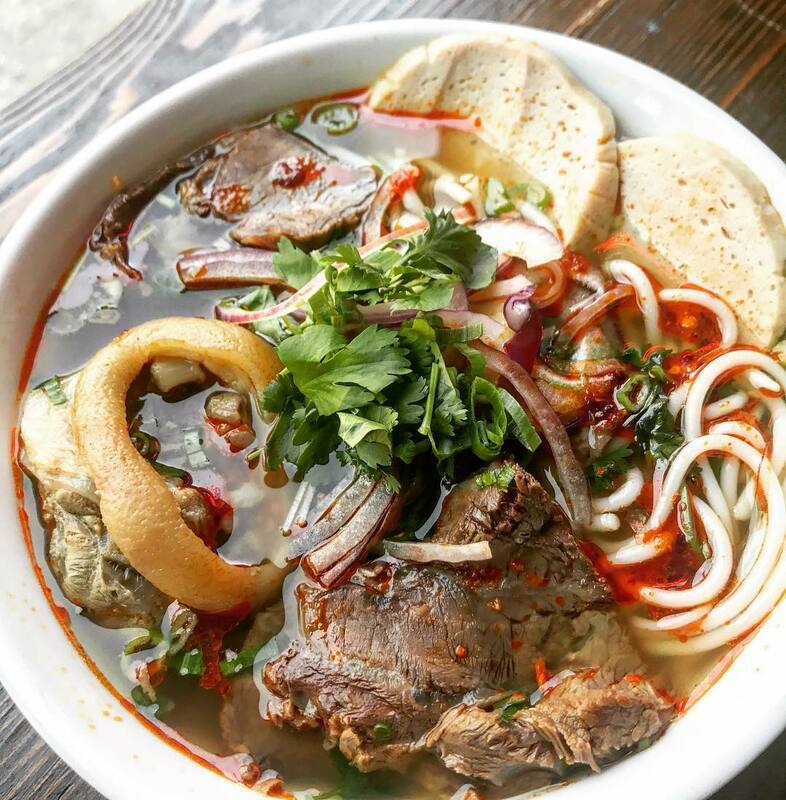 What’s better than having a bowl of Bun Bo Hue right when you’ve arrived at this dreamlike city? 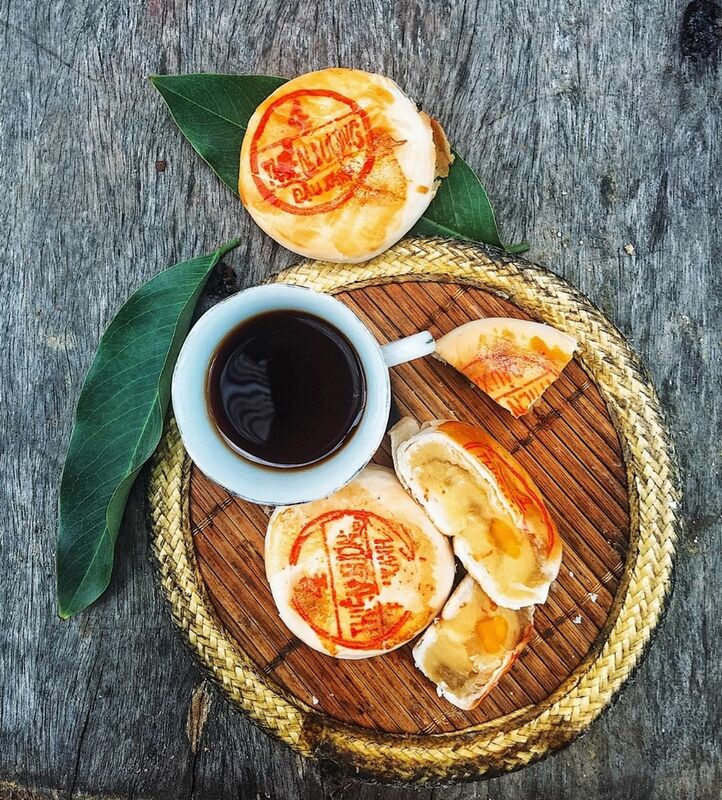 We can’t mention Hoi An without mentioning Cao Lau. 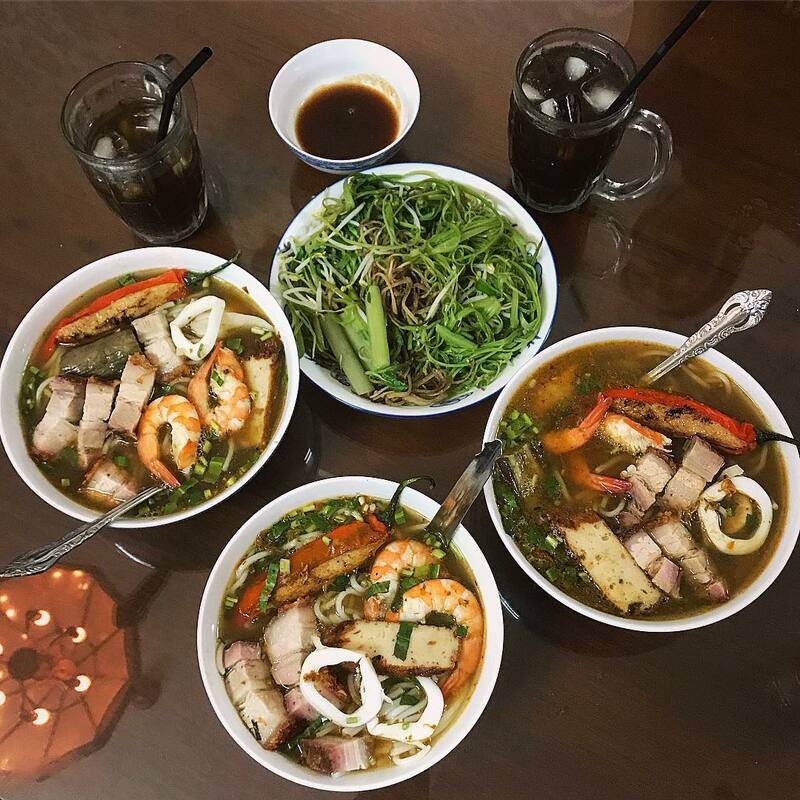 What’s better than spending a day in Hoi An and having yourself a bowl of Cao Lau for dinner? The main ingredient – noodles – is made of white rice and brown rice powder. 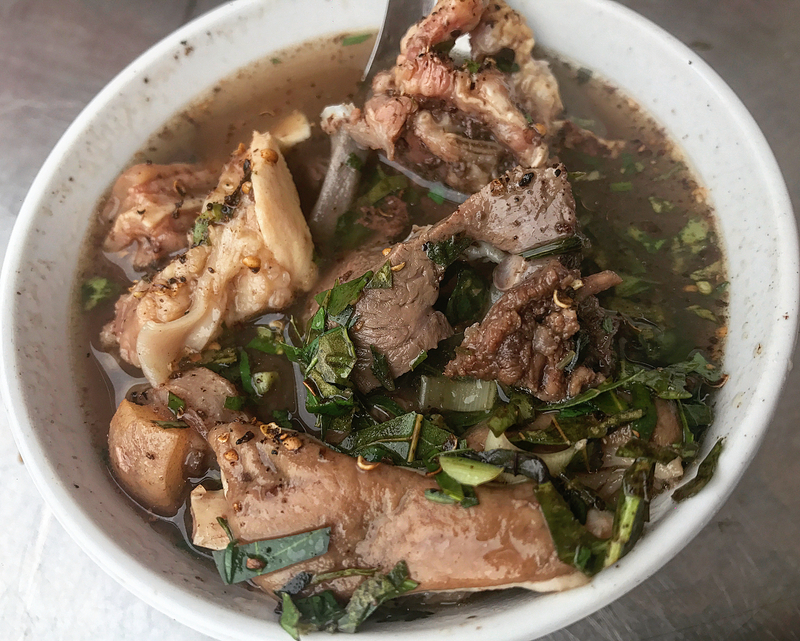 The soup is cooked with mullet’ bones, making this dish a masterpiece in Quang Tri. 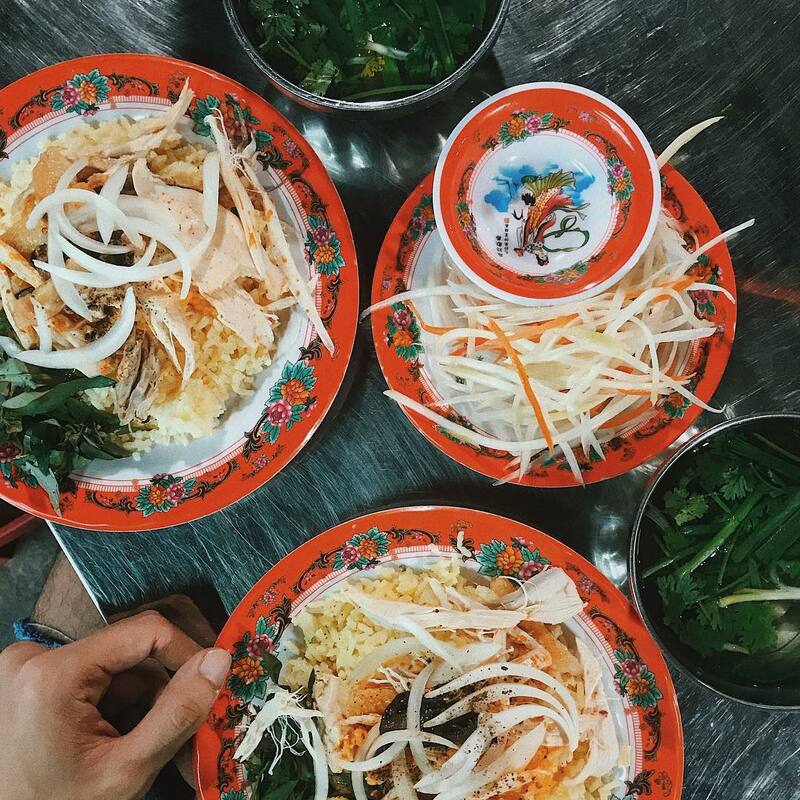 This chicken rice dish is a specialty in Quang Nam. They got the meat from the chickens raised in Tam Ky Garden, and the rice is cooked with cumin powder. Com Hen has the most traditional taste of Hue. The mussels are stir-fried with dried bamboo shoots, then served with peanuts, sesame, salted shredded meat, etc. Banh Canh He is famous in Nau (Phu Yen), and is made of rice noodles with shallot (he). There are plenty of Ca Mai (a type of fish) in Ninh Thuan Beach. To serve the best Goi Ca Mai to the guests, the bones are removed, then topped with lime juice, vinegar and tamarind. 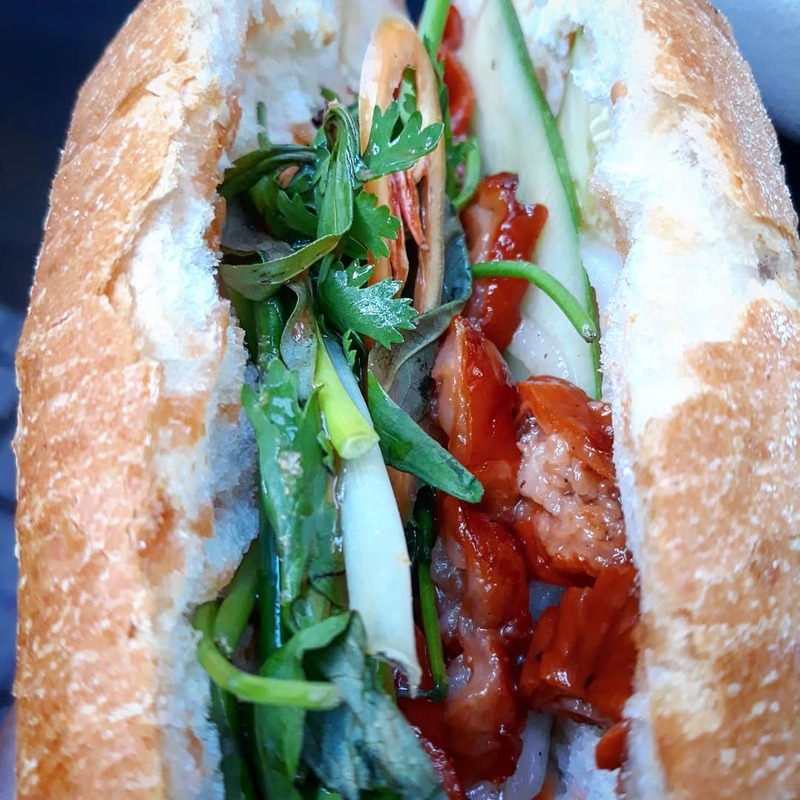 You can’t get satisfied when coming to Nha Trang without having a try on Bun Ca Dam. 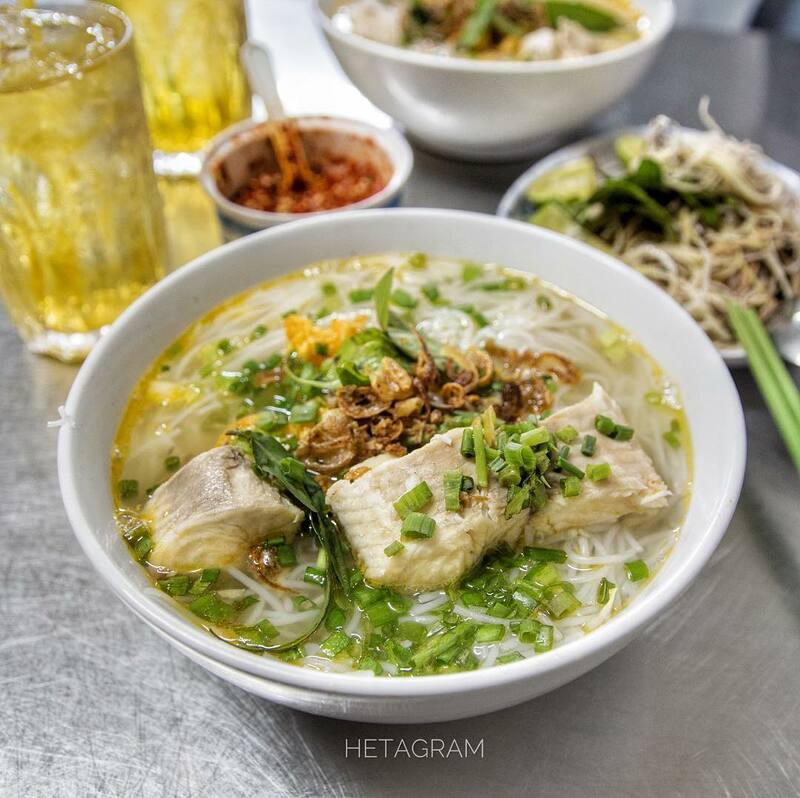 Bun Ca Dam is made up of rice vermicelli, fried fish, and herbs. 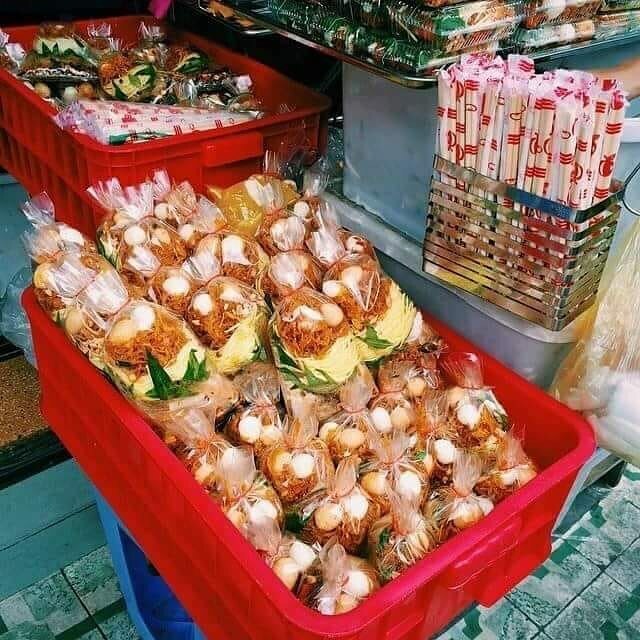 You will see a lot of street vendors selling Banh Dap. The layers of rice paper are filled with boiled pork, grilled pork or pig’s tripes. 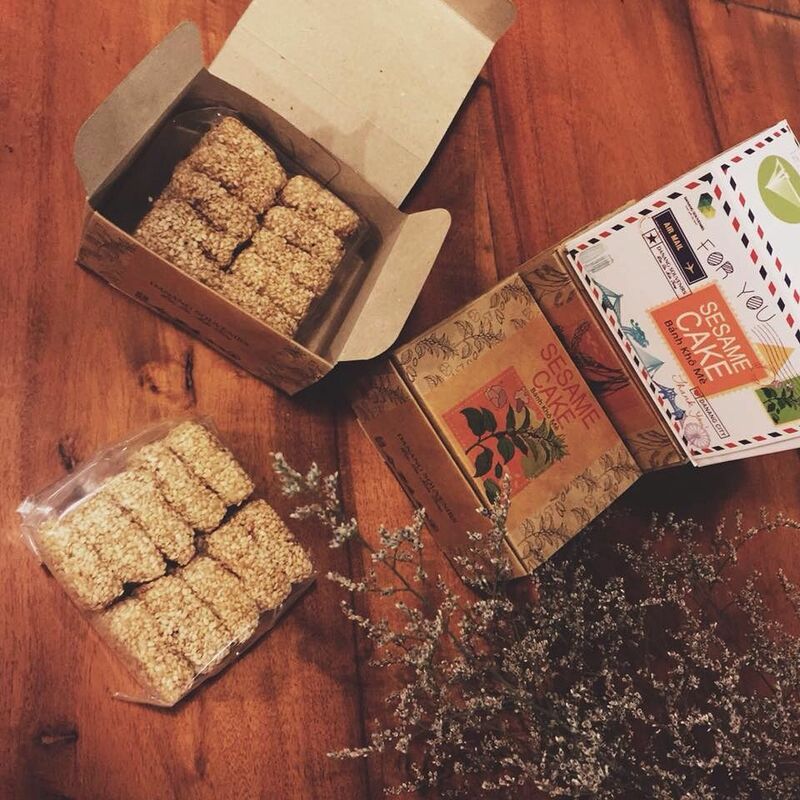 Almost everyone who comes to Danang wants to buy some Tre Ba De to bring home as a “gift”. 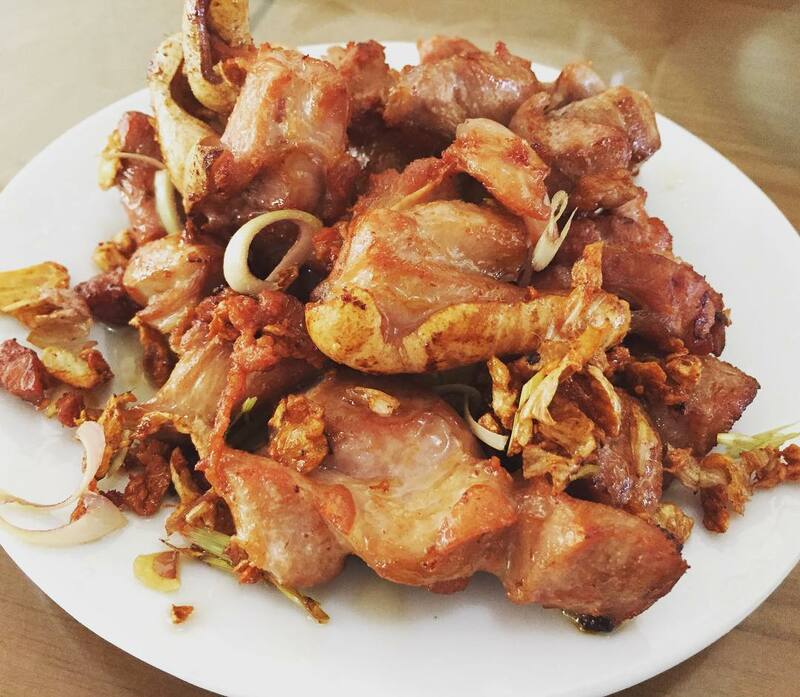 A famous dish, made of dried cuttle-fish, marinated in tamarind sauce and some other peppers. 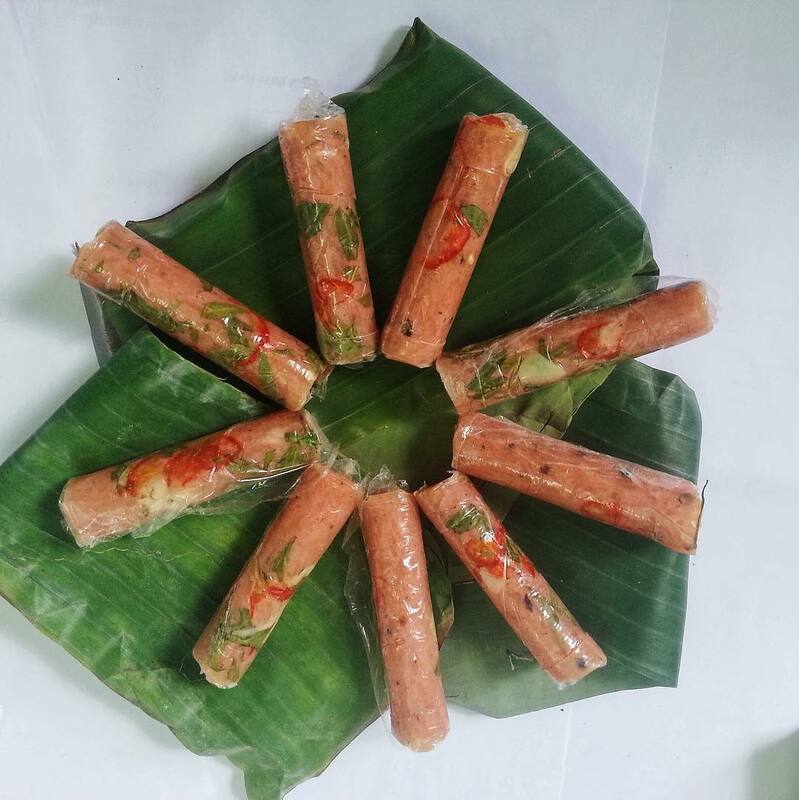 In the past, you can only saw Banh Kho Me on some special occasions; however, these days the local people sell these tiny candies every day, especially in Danang and Quang Nam. 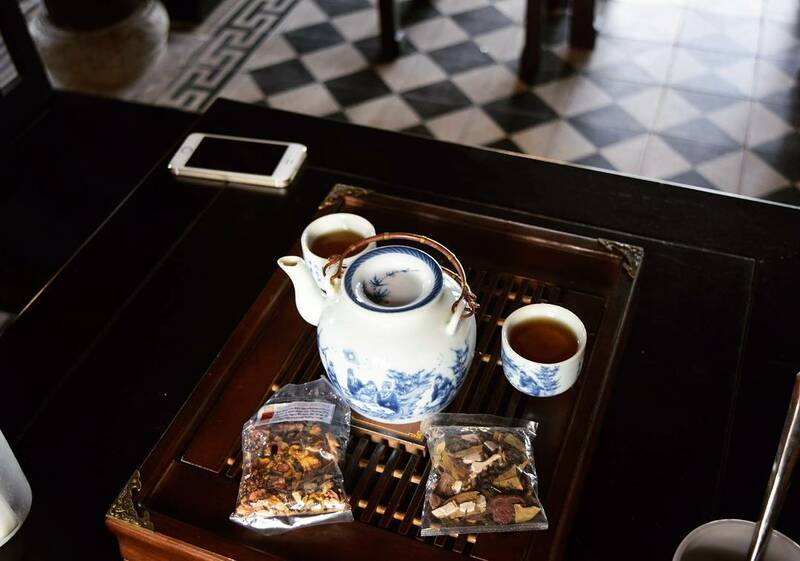 Have yourself a cup of Tra Cung Dinh (Imperial Palace’s Tea) during your trip to Hue. This tea used to be served only for the Kings in Vietnam. Tra Cung Dinh is made of many types of medician plants. 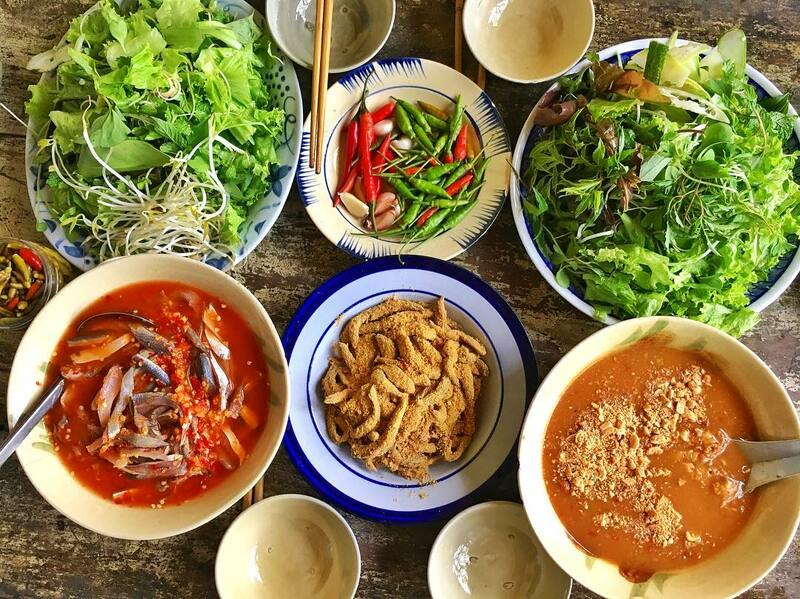 Nuoc Mam (fish sauce) is cooked manually by the fishermen living in Nam O Village, with the same quality as Phu Quoc’s fish sauce. A specialty in Quang Ngai, made from natural ingredients, Que Tra Bong, is one of the 4 valuable and rare medicines Sam, Nhung, Phu, and Que. 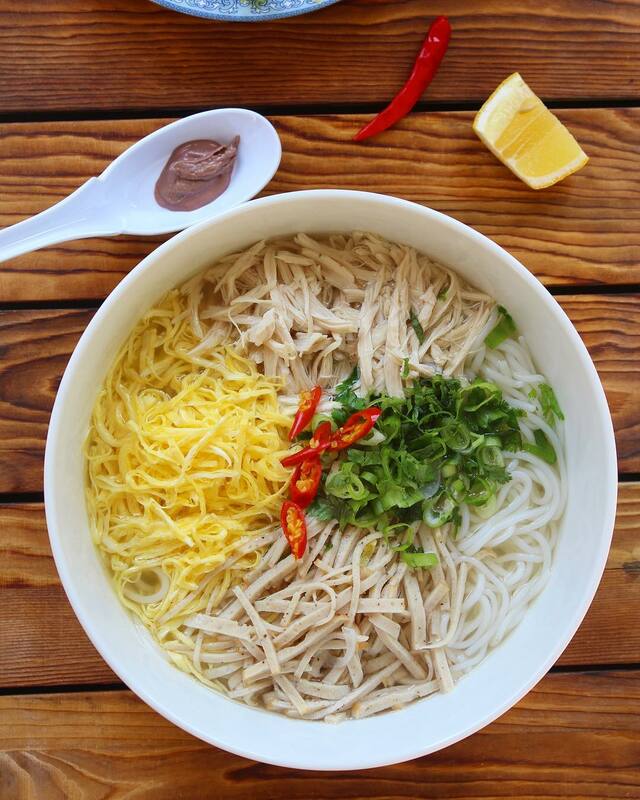 Out of being famous for the beautiful beaches, Danang is also famous for a specialty – Cha Bo. 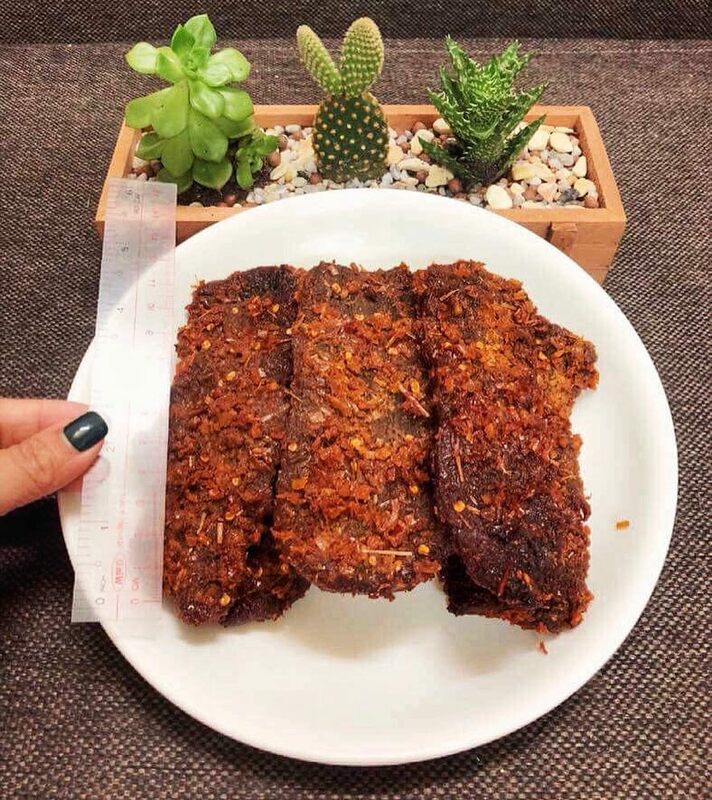 This dish is made of 100% beef. The hardest step of preparing Bo Kho is selecting, because the thigh parts are the best ones. Com Ga Ba Buoi is a popular brand in Hoi An. What makes this dish special is that the rice is cooked in chicken broth. 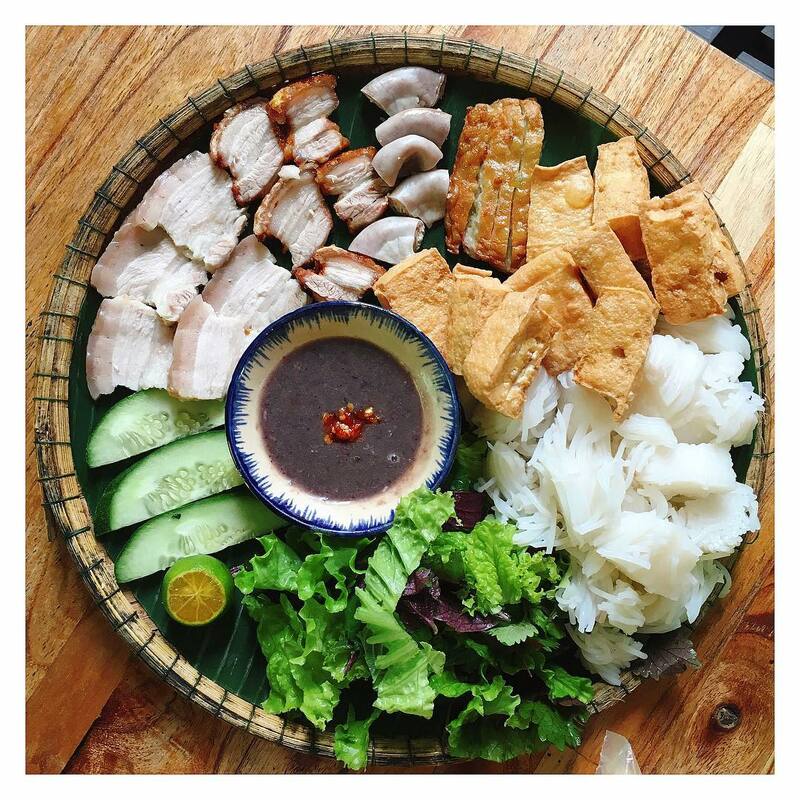 Banh Trang Cuon Thit Heo, appears in all 3 parts of Vietnam. Hower, the one that makes this dish most delicious would probably be the Middle part. 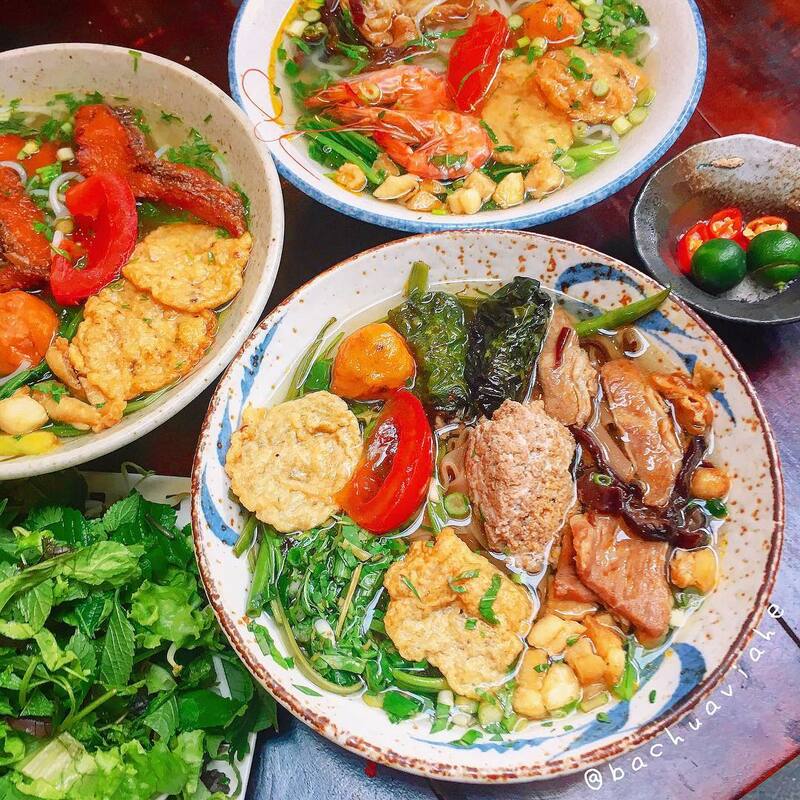 This dish is mostly familiar with the people living in the South Middle part of Vietnam, and there are also some restaurants in Hanoi serve it. 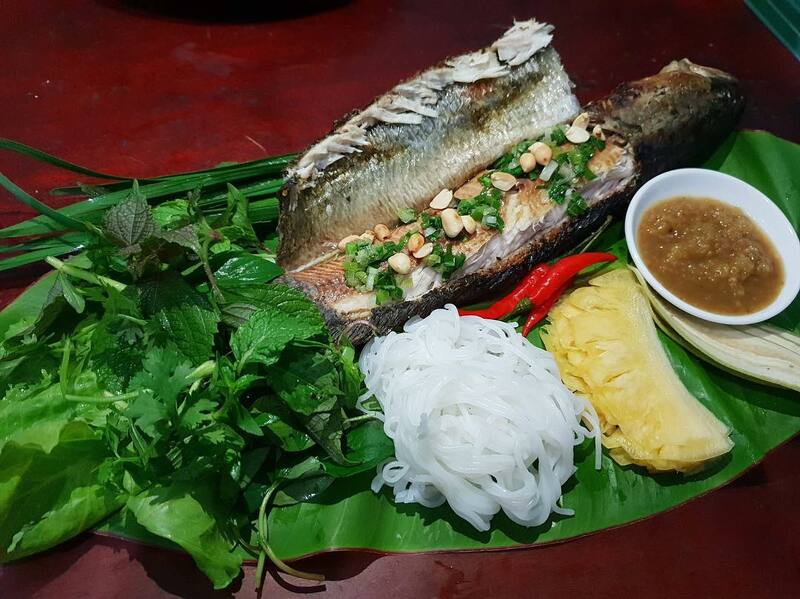 Ca Nien (a type of fish) is a specialty in Quang Ngai, especially in the mountainous villages in the town. The villagers usually find Ca Nien in June every year. 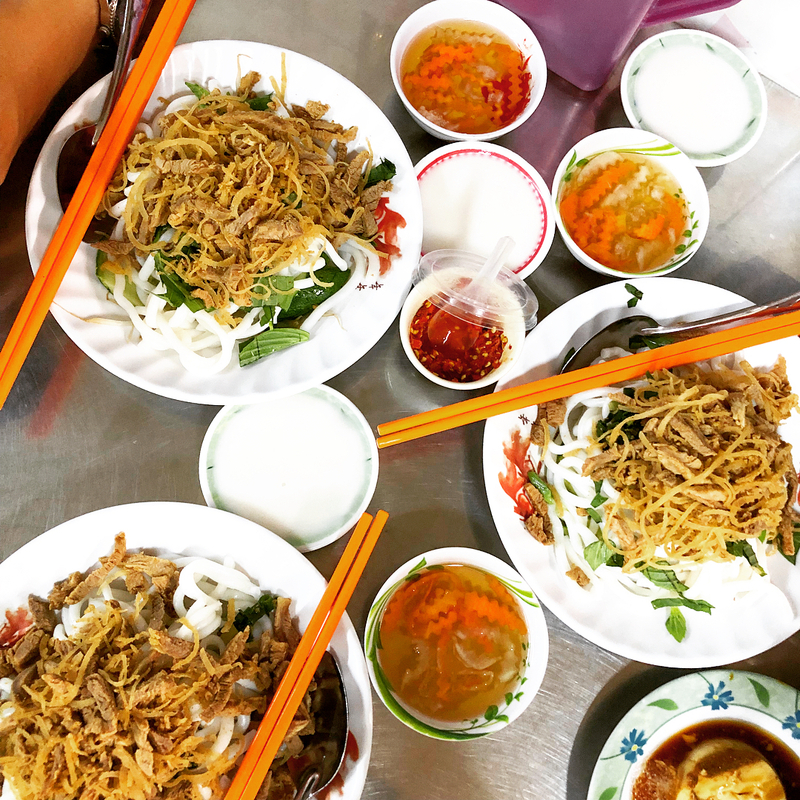 Phan Thiet – the town of beautiful beaches – is extremely popular for Banh Can, which often goes with 3 different sauces. 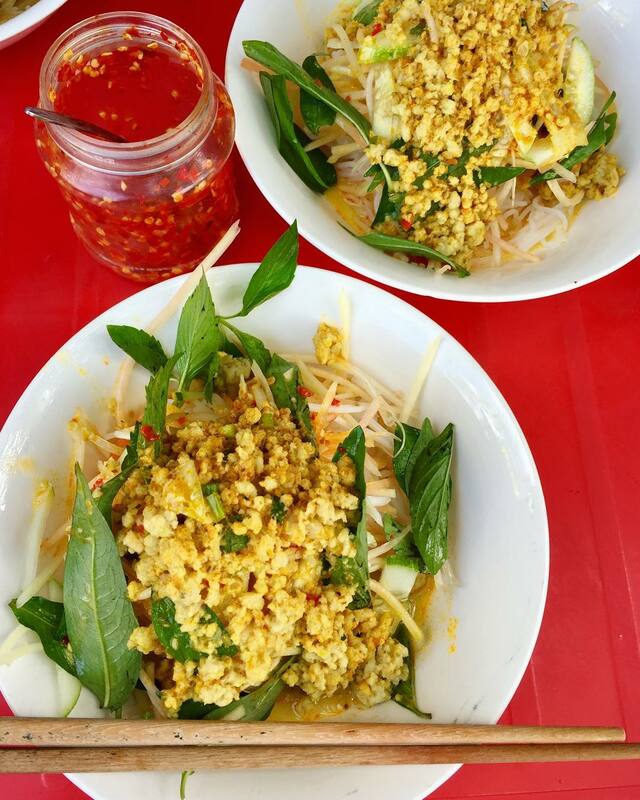 Banh Beo is made of simple ingredients: rice powder, ground shrimps, and dipping sauce. Banh Hoi is only good if it combines with herbs, pork tripes, pork baloney, and rolled in rice papers. One of Thanh Hoa’s masterpieces. 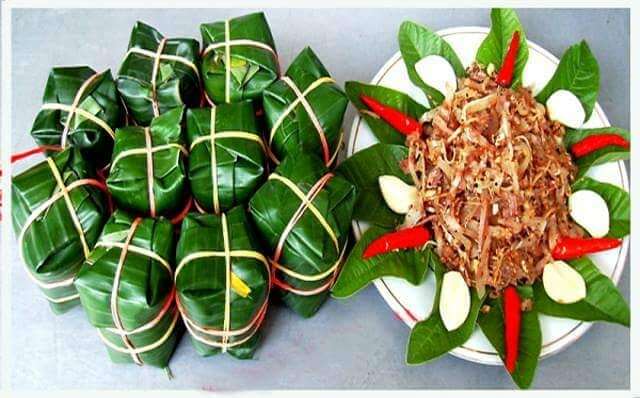 Whoever enjoys this famous food can feel the mixture of rice powder, pork fillings, and the taste of the wrap – banana leaves. 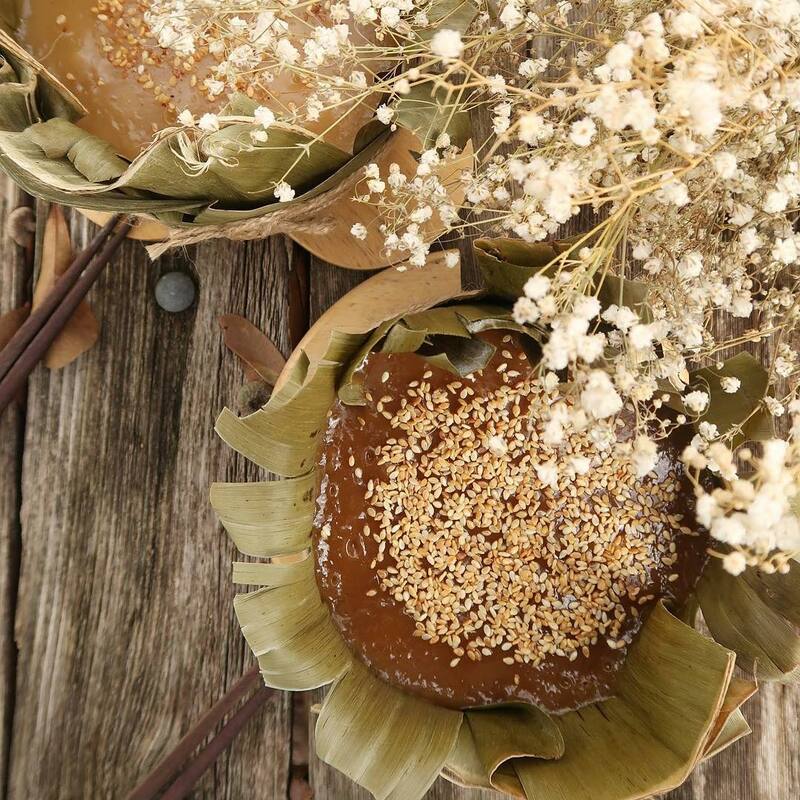 Banh To (in Quang Nam) is made from sweet rice powder, black sugar, ginger, sesame, and oil. If you usually eat Banh Gung (ginger cookies) during Christmas, we have ginger cookies at any time of the year. Instead of being baked, these ginger cookies are deep fried until golden. If you’re so into this dish, you’re lucky, because it’s so easy to make. 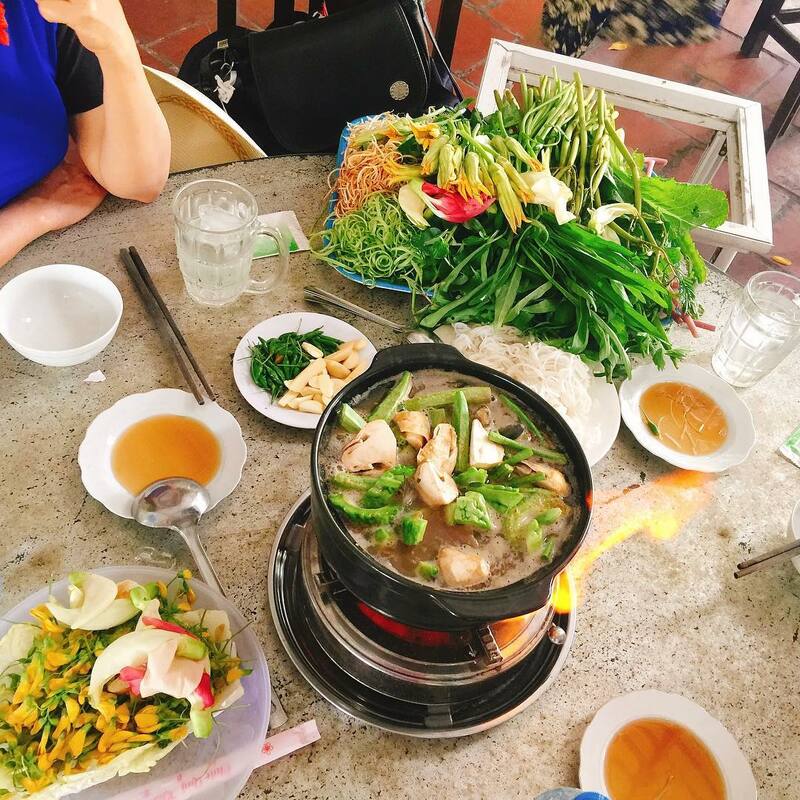 Tom Chua is served widely; however, the best Tom Chua would be in Hue. This is the mixture of shrimps, garlic, and hot pepper. Bo Kho Mat Mia – meaning: beef stewed with molasses, which usually appears during special occasions. 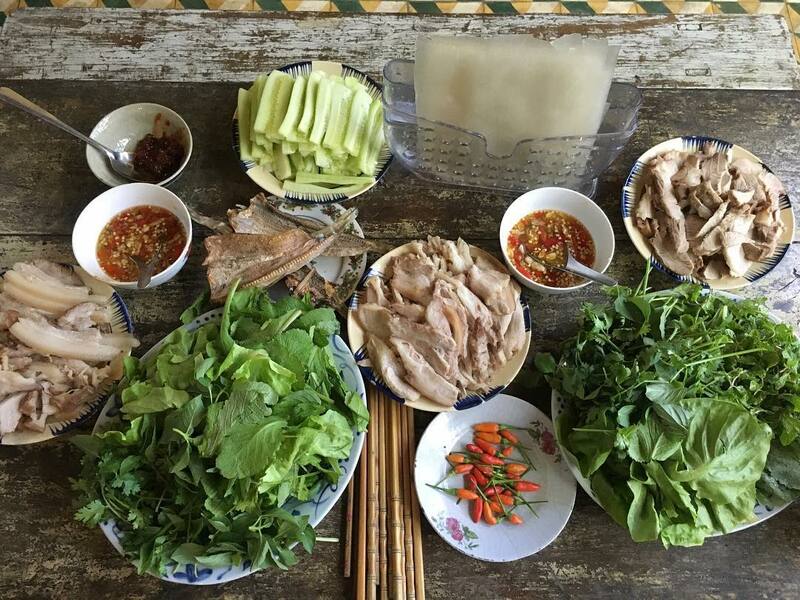 For the Quang people, Thit Heo Ngam Nuoc Mam has become a traditional dish on Tet holiday. 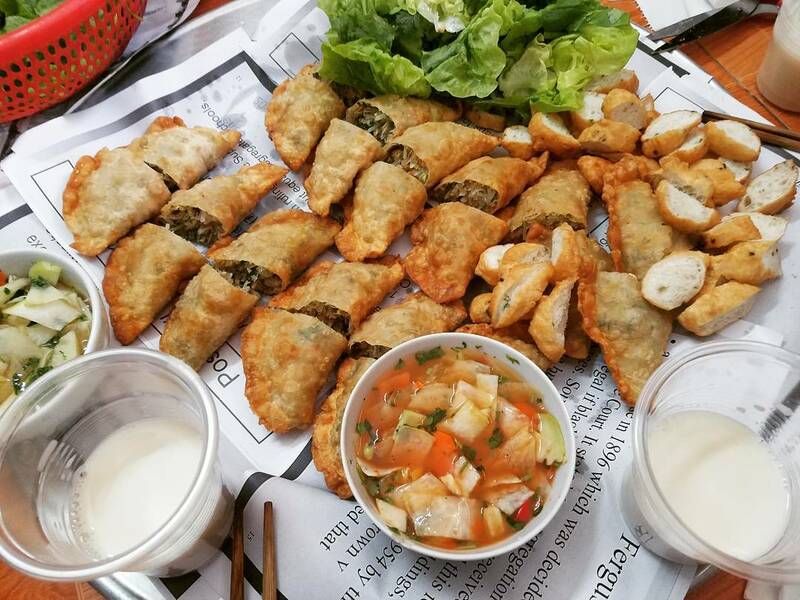 When guests visit during Tet holiday, the people living in the Middle part of Vietnam usually invite them to drink wine and eat Nem Chua. They marinate the raw pork then wrap it with banana leaves. 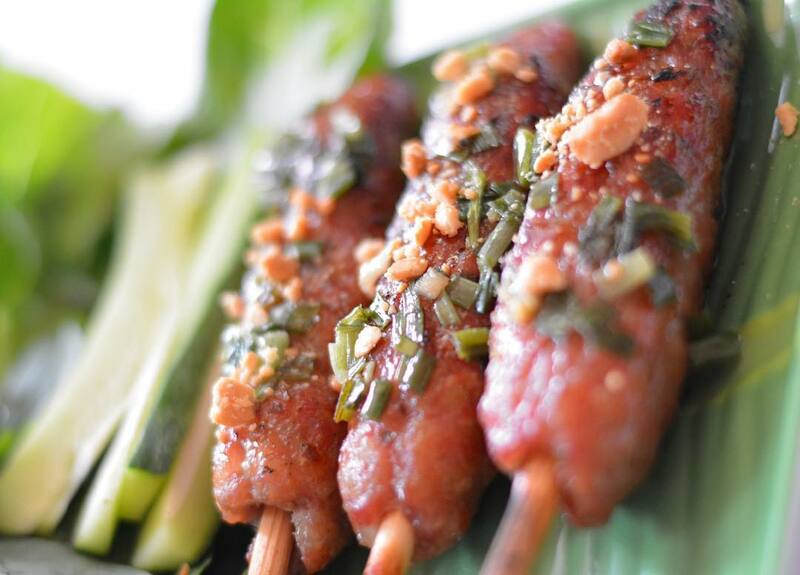 We often eat Ca Loc Nuong Trui with herbs, thin rice papers, fresh rice vermicelli, and dip them in tamarind sauce. 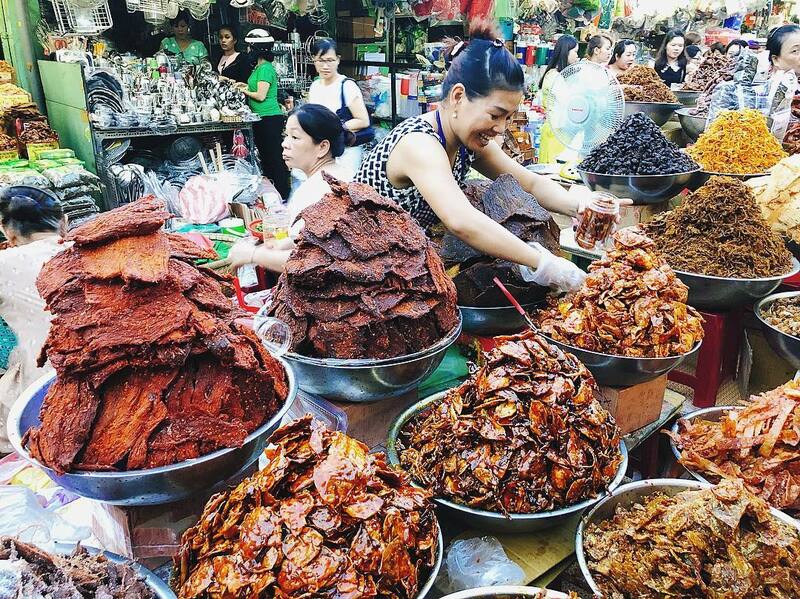 Lau Ca Keo stands out for the sourness of La Giang (a type of herb). Ca Keo (fish) is only as small as our thumb, and tastes exceptionally great. 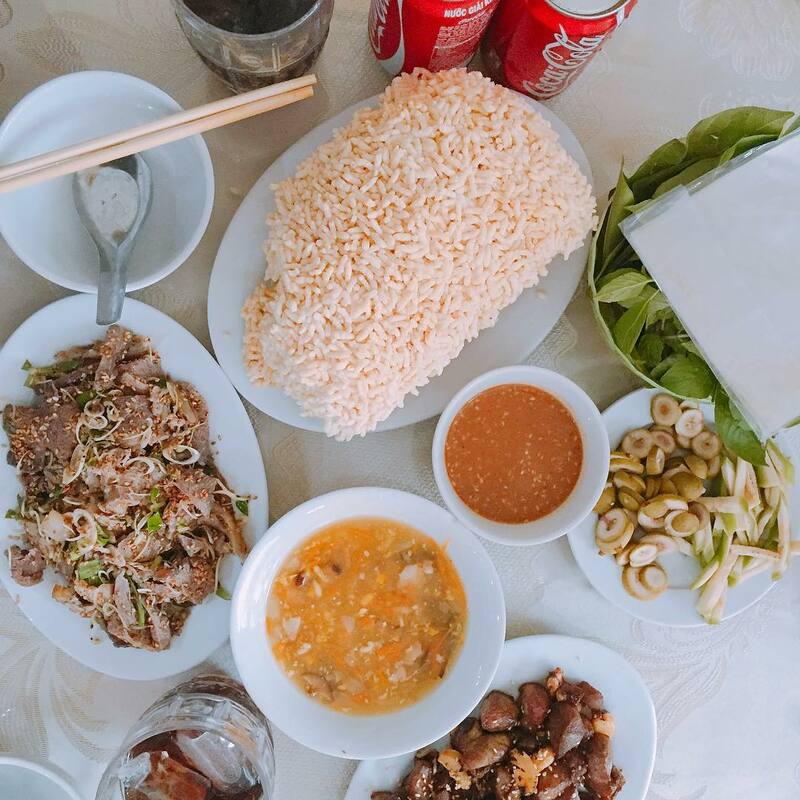 Some restaurants in Saigon offering Lau Ca Keo are on Ba Huyen Thanh Quang Street (District 3). 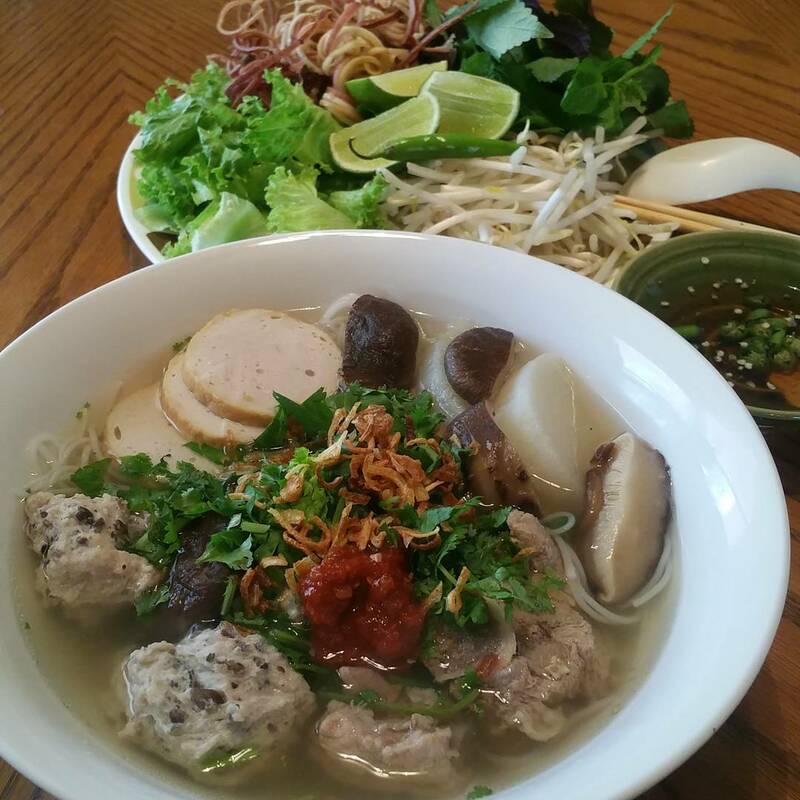 Nem Nuong Mien Tay has the sweet flavor of sugar. 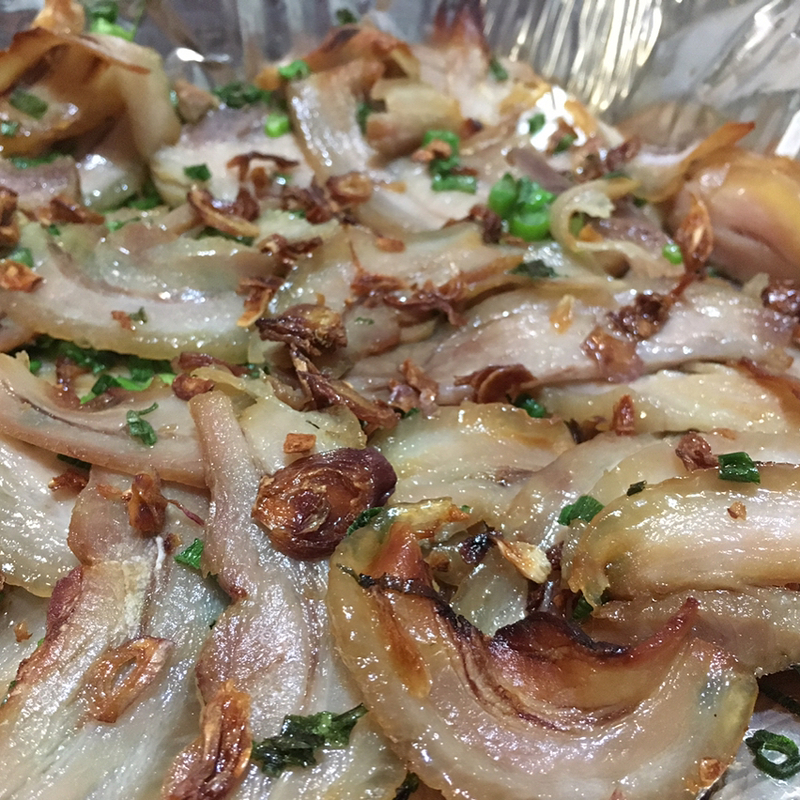 According to the owner of a traditional restaurant named Long An, to prepare a good Nem Nuong Mien Tay, the chef has to cook the pork that has just come out of the oven. 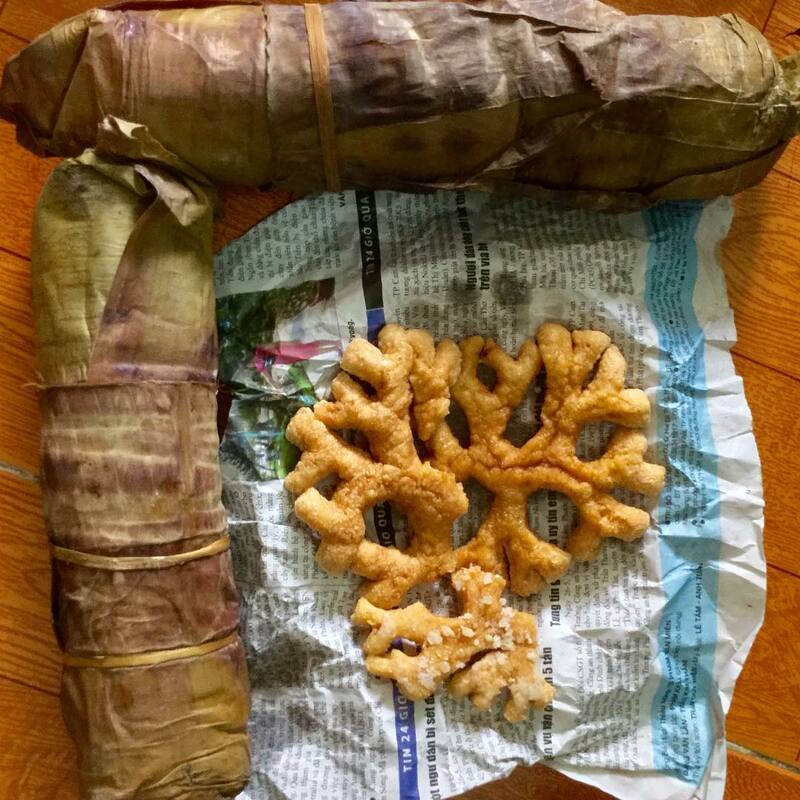 The famous brands that offer Chao Long in Southwest of Vietnam are Cai Tac and Chau Doc. Chao Long means porridge with pork tripes. 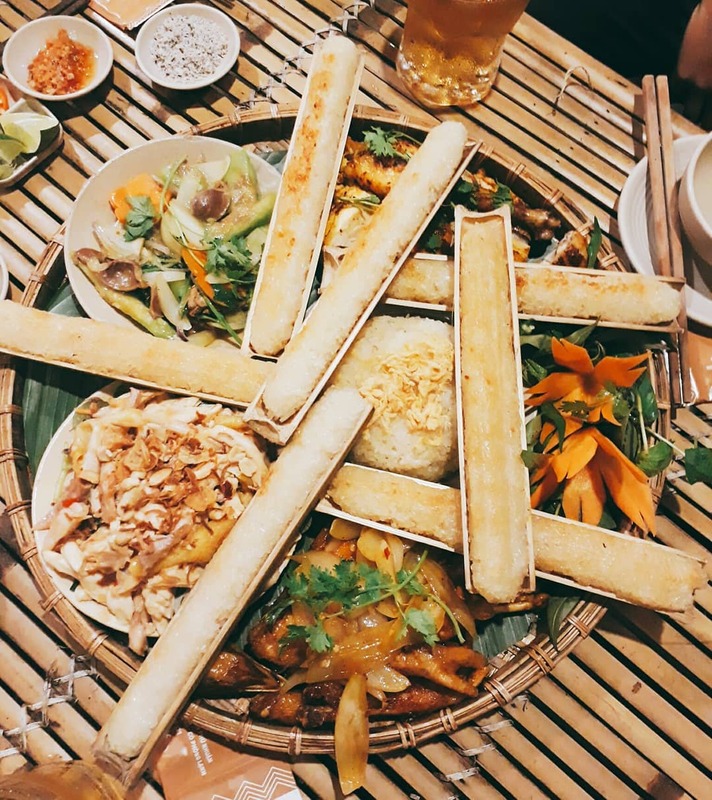 Banh Tam Bi is a historic dish in Southwest of Vietnam. 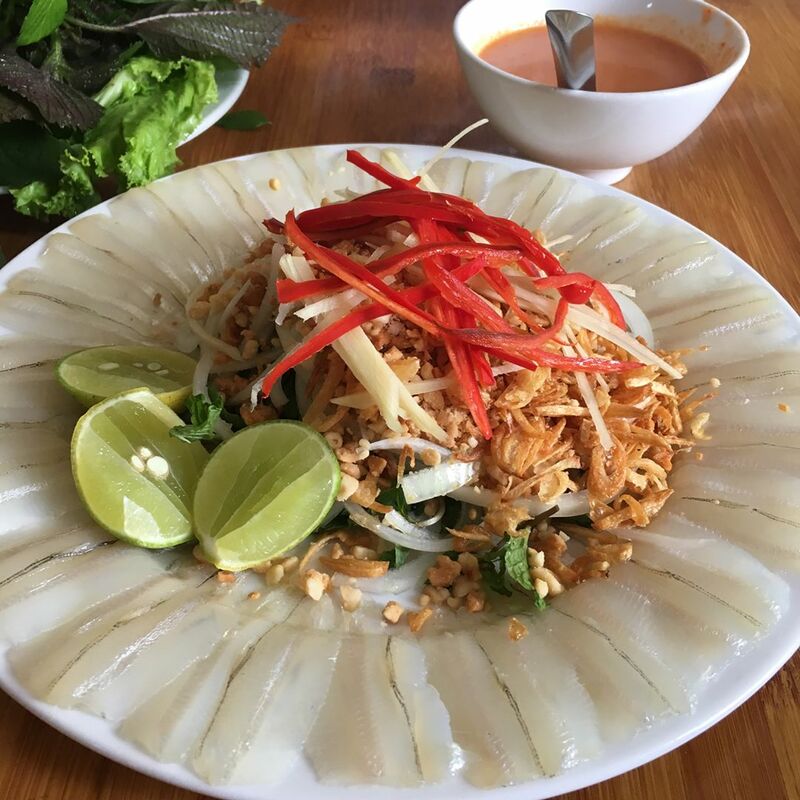 Banh Tam Bi is the combination of the saltiness of the fish sauce, and the sweetness of the coconut milk. 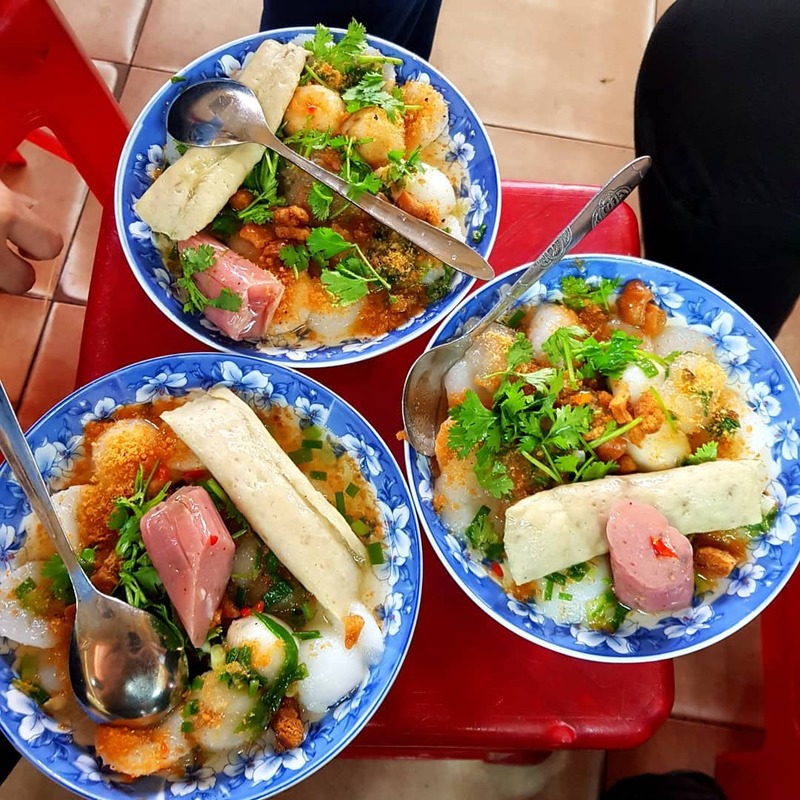 Unlike Banh Beo xu Hue, the people in Southern Vietnam make Banh Beo in Southern Vietnam by pouring the batter into tiny plates, and filling it with ground beans, shrimps, sweet and sour sauce and coconut milk. 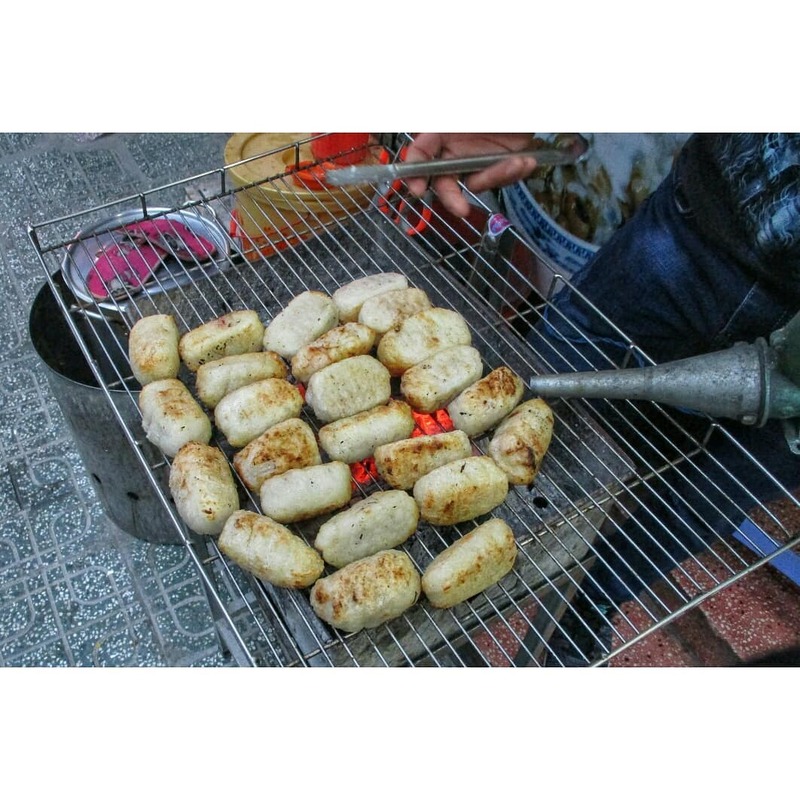 Chuoi Nuong are bananas grilled on coal stoves, and are eaten with coconut milk and roasted sesame. 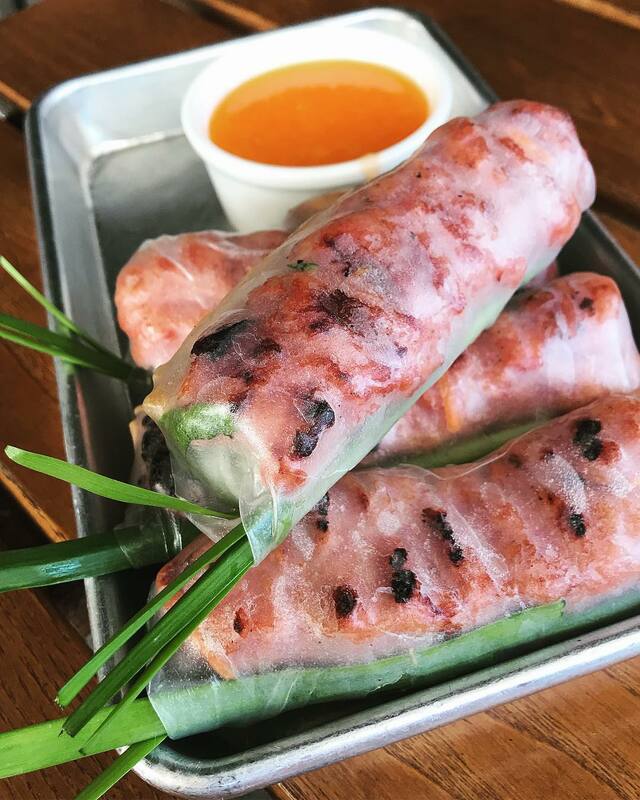 Nem Cuon has the same ingredients as Nem Nuong, but are served just like Goi Cuon. 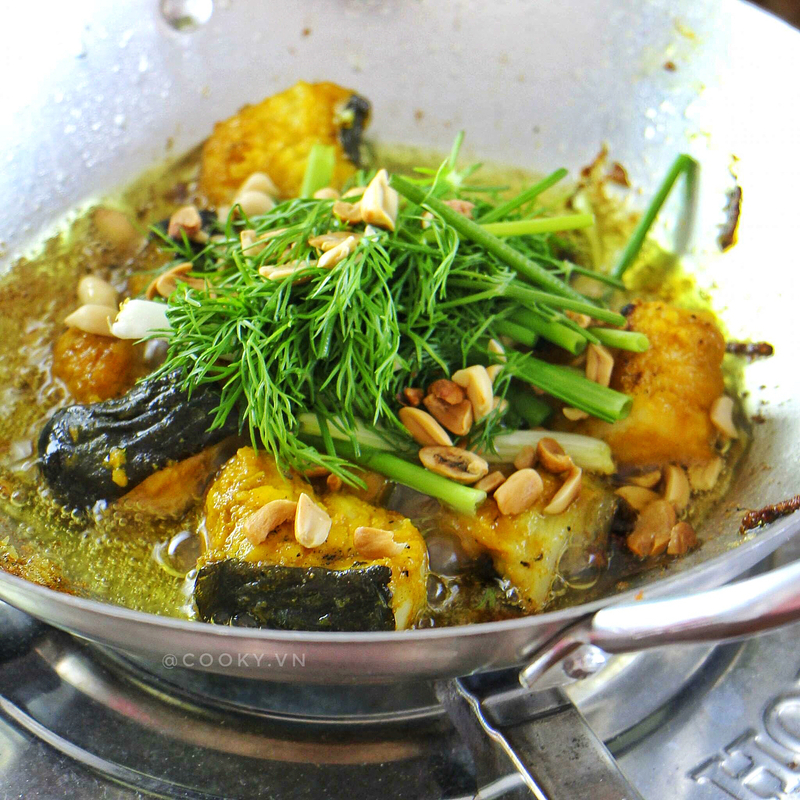 This dish is very famous in Chau Doc (An Giang) – where this sauce (Mam Thai) was born. The batter is poured into a large pan, so the size of Banh Xeo Mien Tay is pretty large. 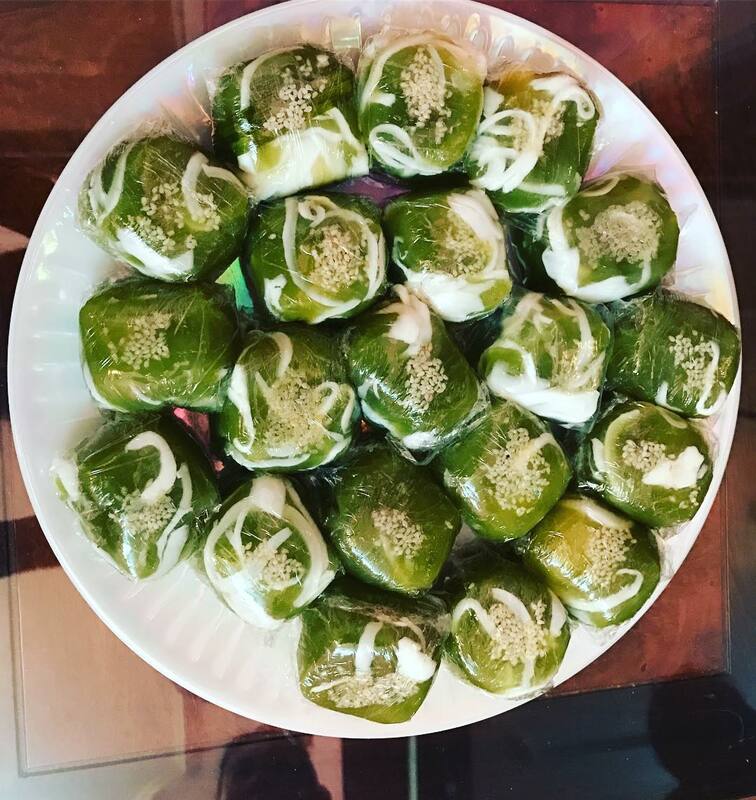 The process of making this dish is quite hard, but the thing that makes it delicious is that Banh Ong La Dua is mixed with pineapple leaves to make it green. 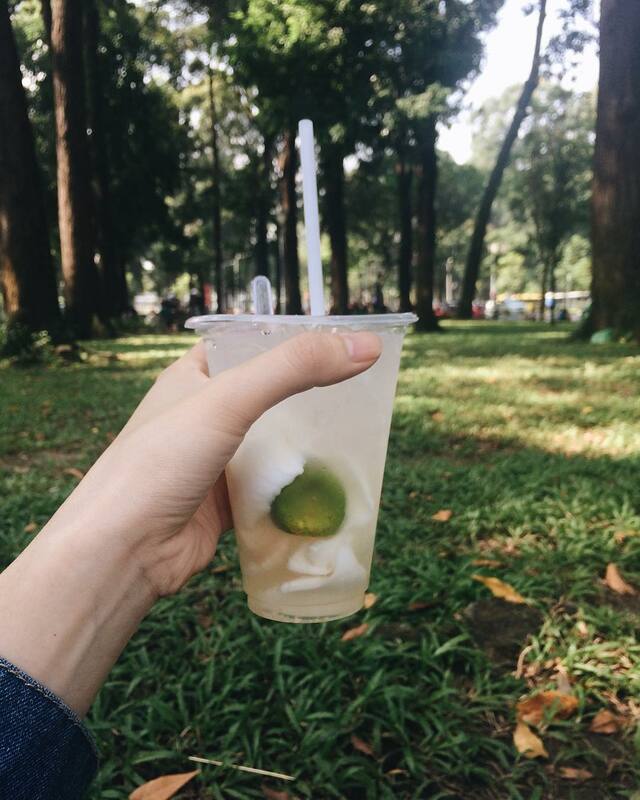 Nuoc Co Lau tastes like jelly, helps to cool and detoxify your boy. Bun Mam is considered to be the tiny version of Lau Mam. Bun Mam includes fish, roasted pork, shrimps, and eggplants. 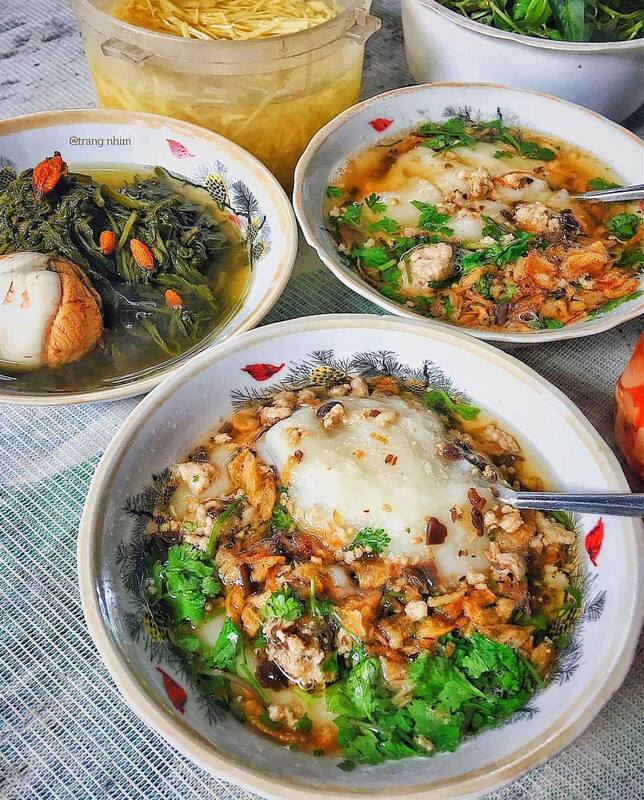 Bun Ca Loc is one of the classical specialties in Southwest of Vietnam. This dish varies by the people who cook it. 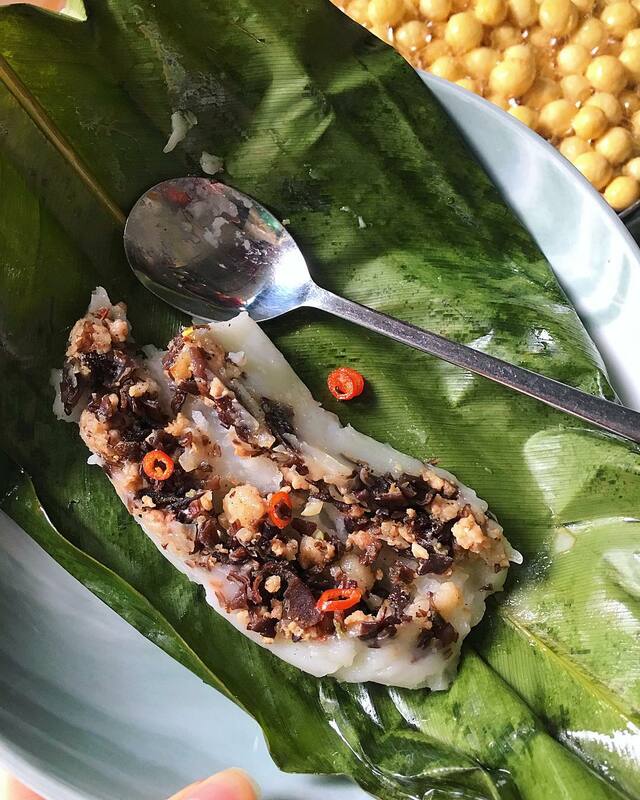 Bun Ken is famous in Ha Tien, with the fish stir-fried with cumin. 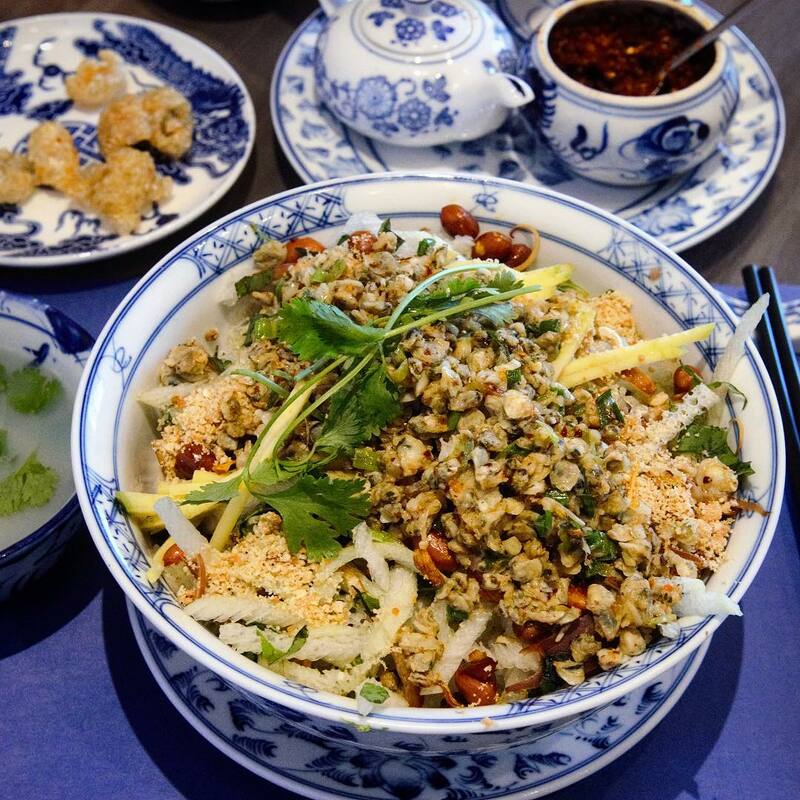 Hu Tieu My Tho was made based on Chinese Hu Tieu more than 300 years ago. Com Goi La Sen is mostly found in Dong Thap – the city that’s famous for the beautiful lotus ponds. 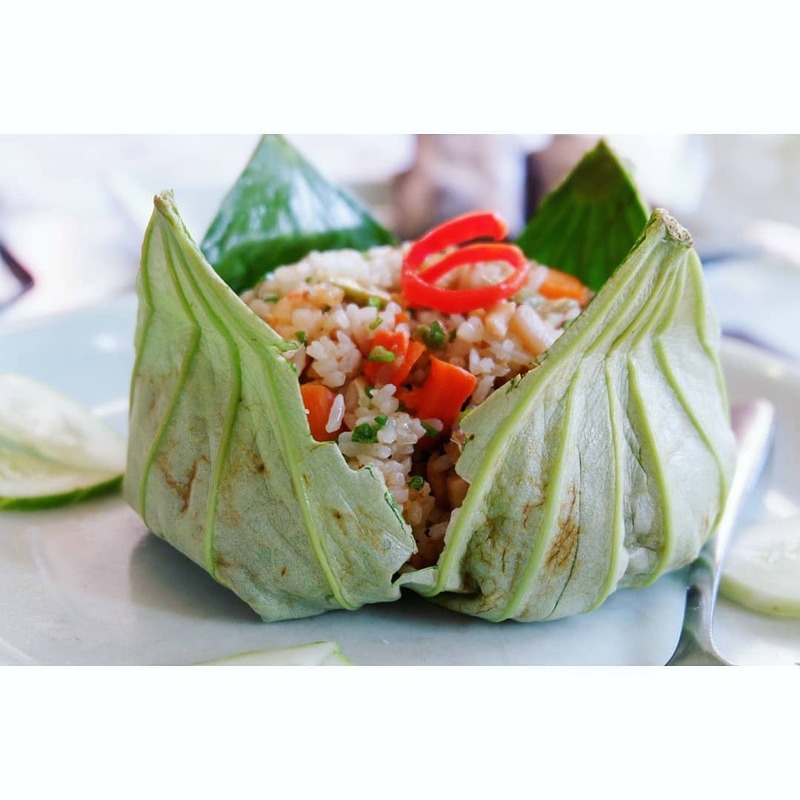 This dish is rice cooked in lotus leaves. 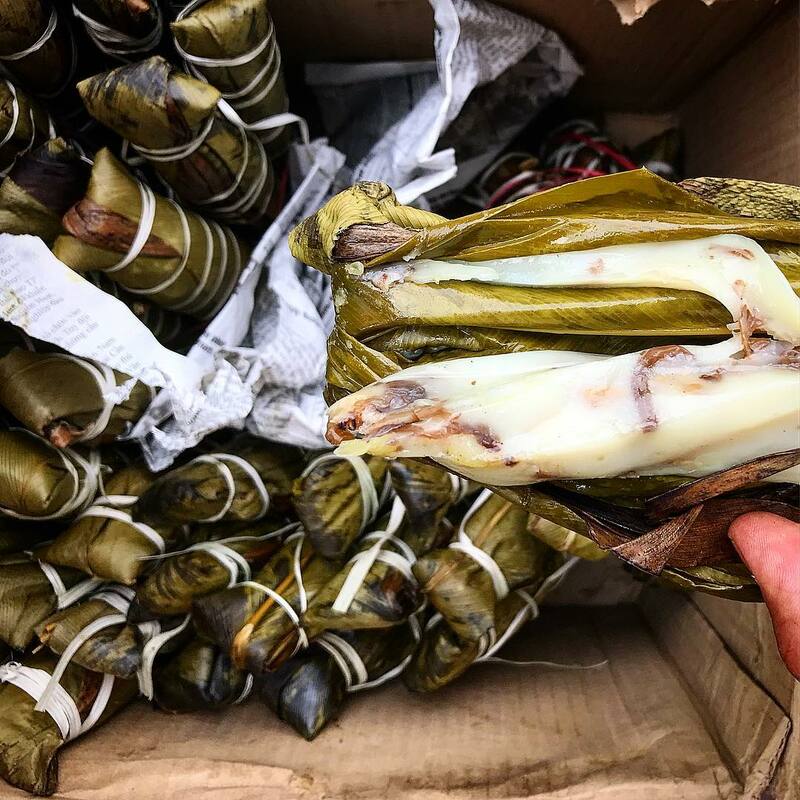 The Khmer (an ethnic minority group) in Tra Vinh usually harvest sweet rice about 1-2 weeks earlier, then peel the skin to take out the young rice – Com Dep, which is a necessary ingredient to make Banh Tet – a dish that we have for Tet holiday. Vinh Long has a lot of farms that grow fruits, and pomelo is the most chosen one. 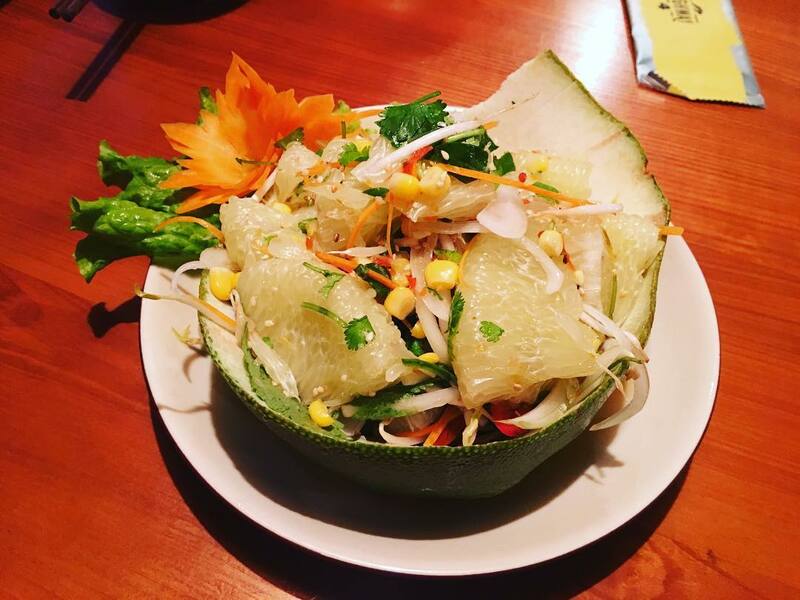 A lot of tourists wants to know the recipe of making this outstanding pomelo salad after their first try. 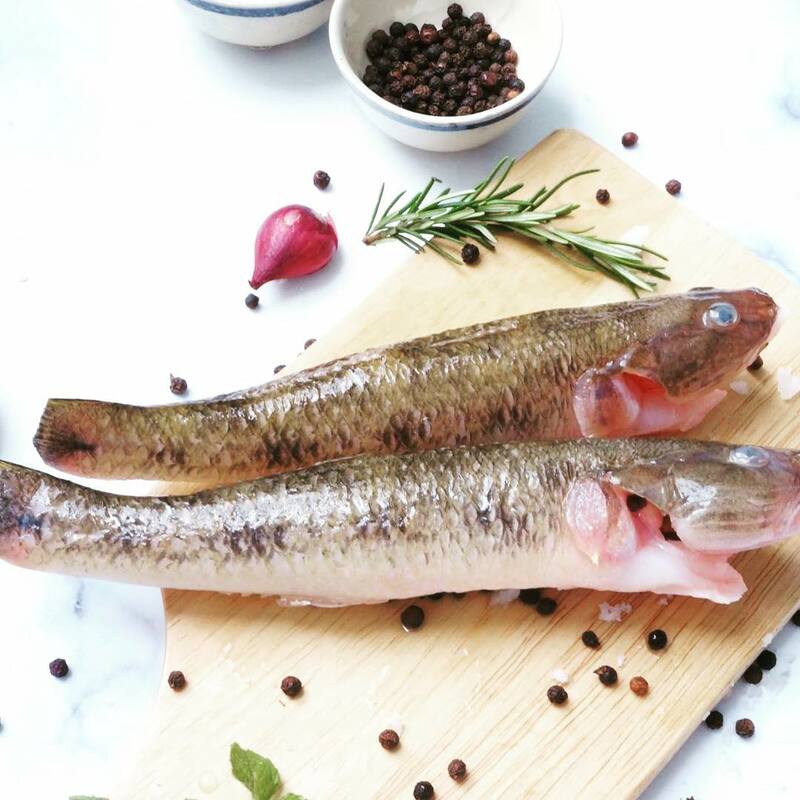 In recent years, there are less Ca Linh (a type of fish) than before, so make sure to find the best restaurant that still serve this popular food. If you have a chance to visit An Giang, you will find a lot of street vendors selling Banh Bo Thot Not. If you’re a true durian lover, this will be the best choice for you. 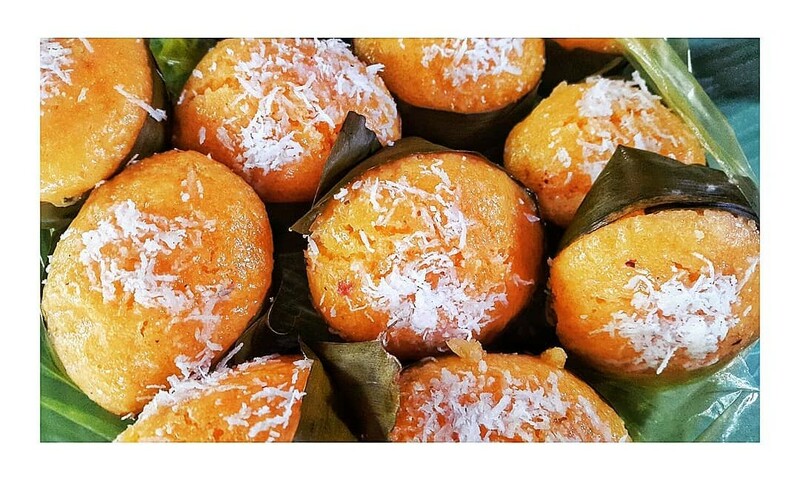 Banh Pia is the combination of durian and salted eggs. The thing that gives Banh Tam Bi in Bac Lieu an exclusive taste is the thickness of the dipping sauce, and the softness of the noodles. Ca Trich is totally good for your metabolism. The trick that not everyone can cook this nicely is the way of cutting the fish. 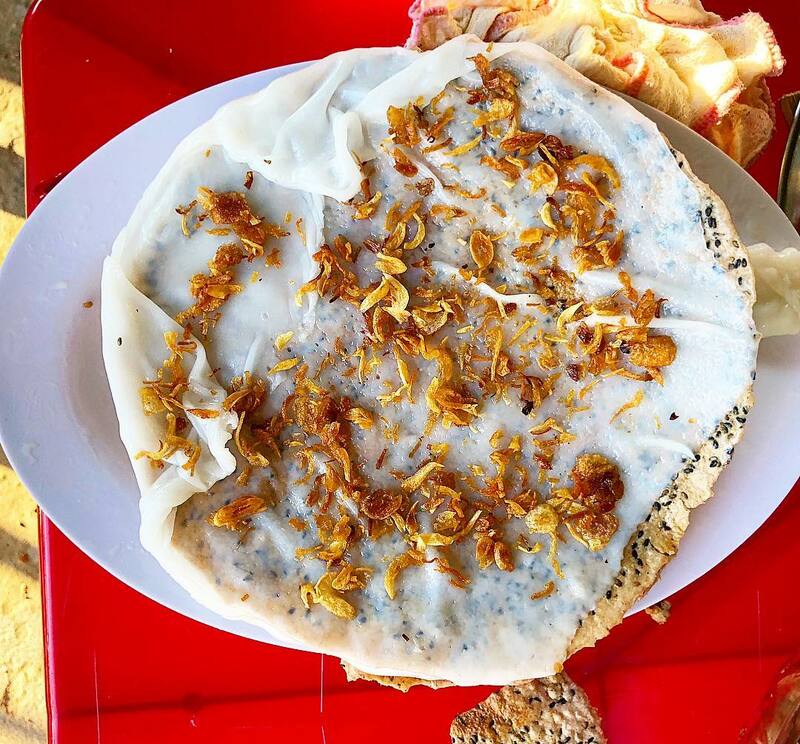 Banh Trang Tron is made of ultra-thin rice paper and a variety of other species, and it has always been the favorite snack of Southern people. 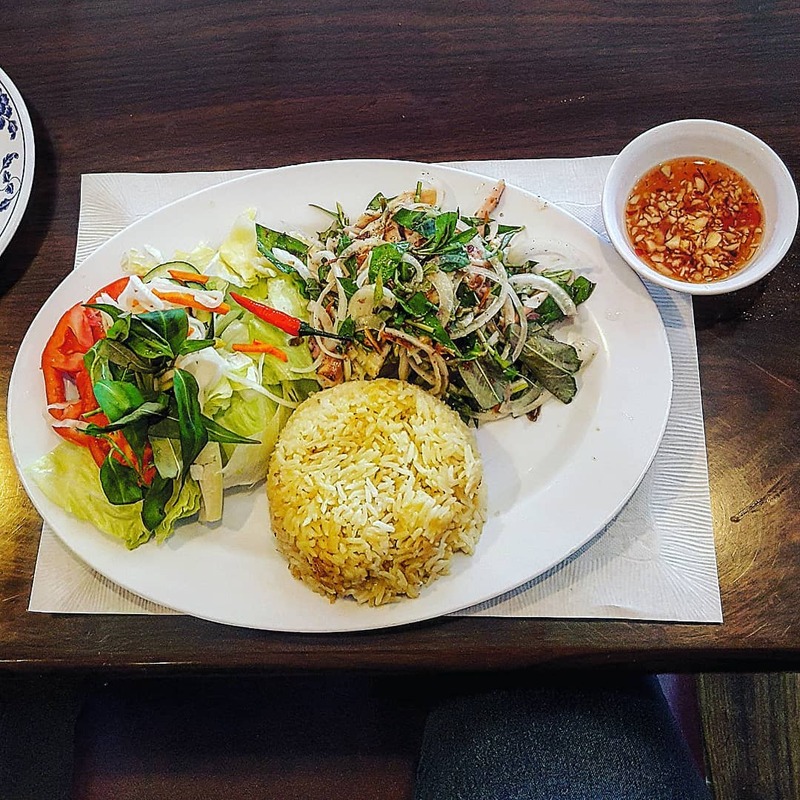 Com Tam is a very fun version of rice. 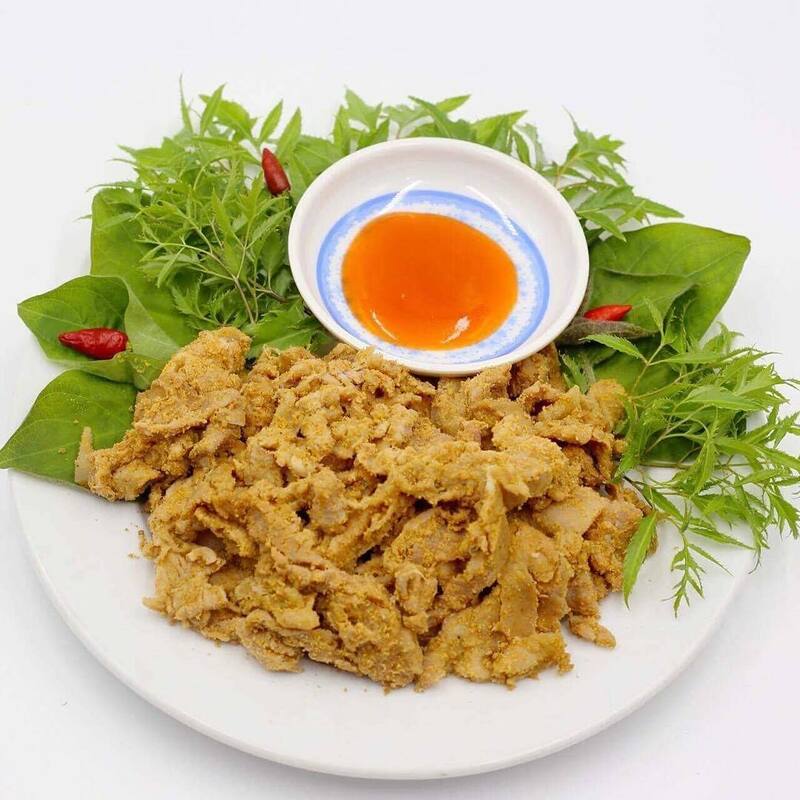 Originally, Com Tam is made of the tiny and soft dust left after the grinding process. 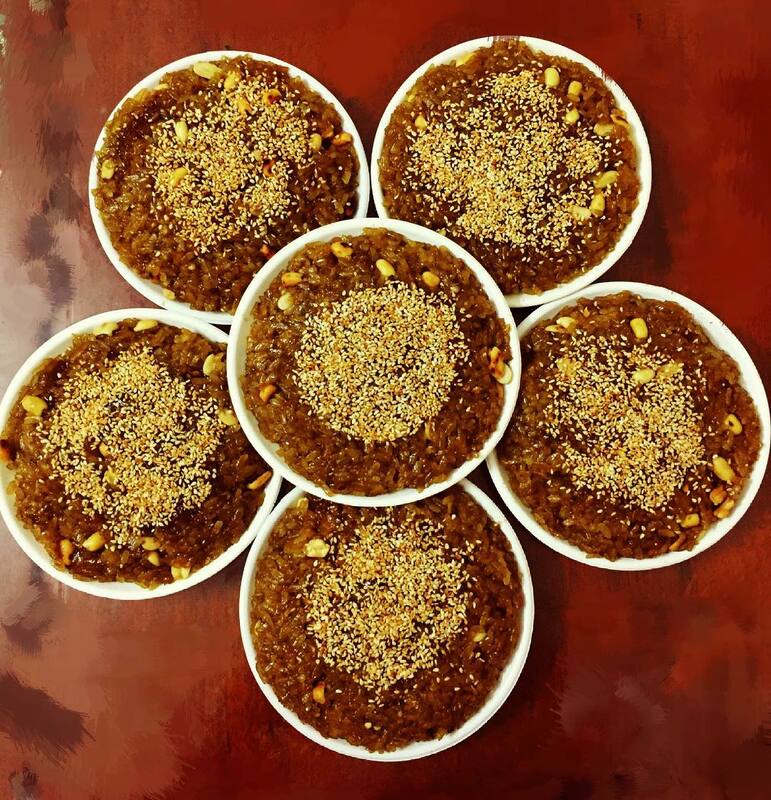 However, these days, they simply use broken rice to make and serve it with various side dishes including rib, chicken and spicy beef. Simply made with every leftover part of the pig, including organs, tongue and ears. The spices, however, vary greatly. Undoubtedly, Pha Lau is a part of the Southern childhood. 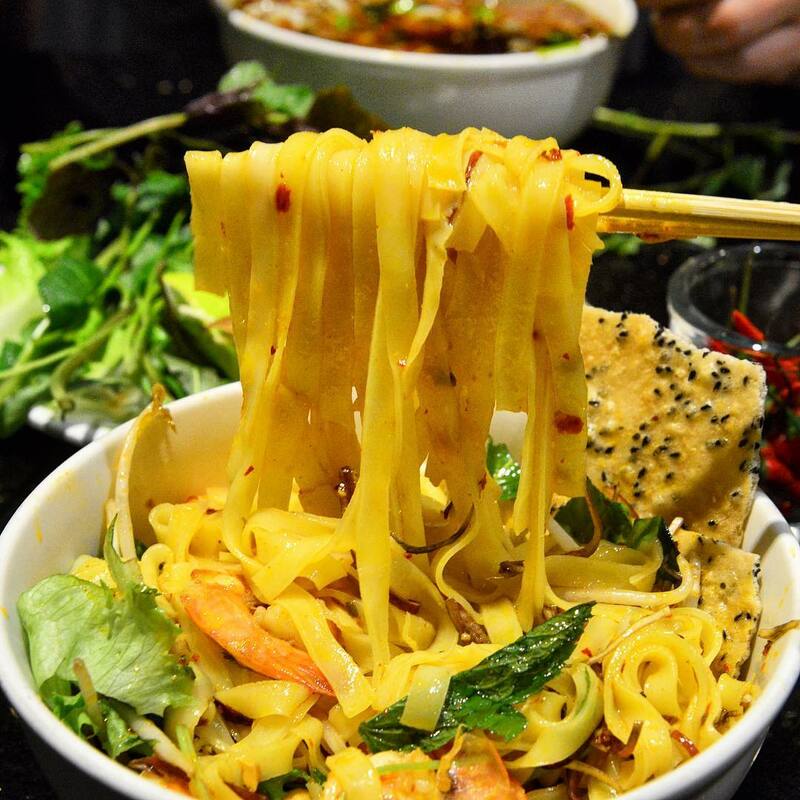 This is the perfect combination of the two most exotic Vietnamese dishes. 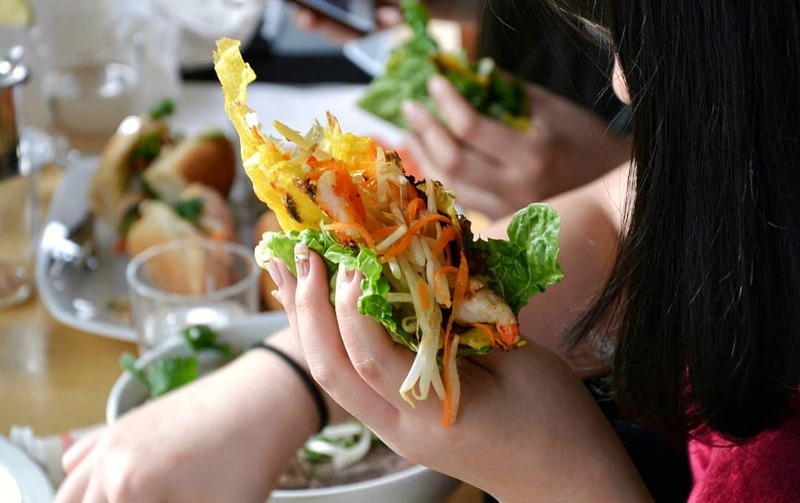 Banh Mi is now the wrap of the flavorful Pha Lau, giving you a convenient and nutritious dish. 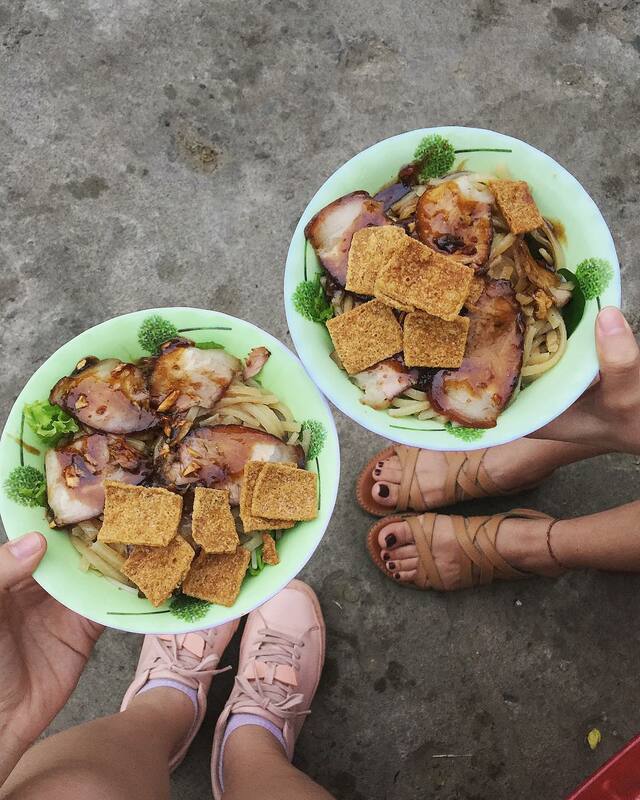 The street food in Sai Gon has never failed to amaze even the toughest visitors. This dish is amazing from its ingredients. Literally, its translation into English means “Fried batter”. However, with the flavorful topping like onions, pork, etc, this will be a perfect snack for your afternoon. Sai Gon people are very creative in making streetfood. Bap Xao is a very typical. 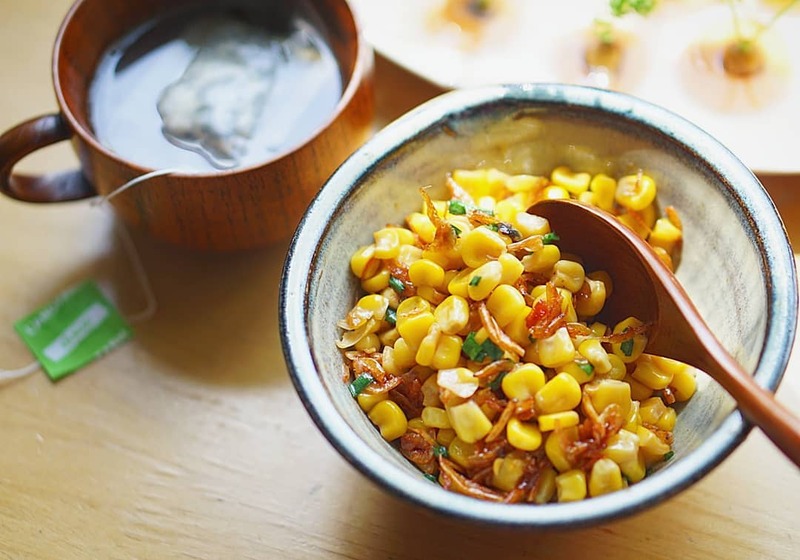 They usually mix corn with dried shrimps, then stir fry them together and serve hot on the streets of Saigon. Another simply soup for your afternoon is Sup Cua or crab soup. 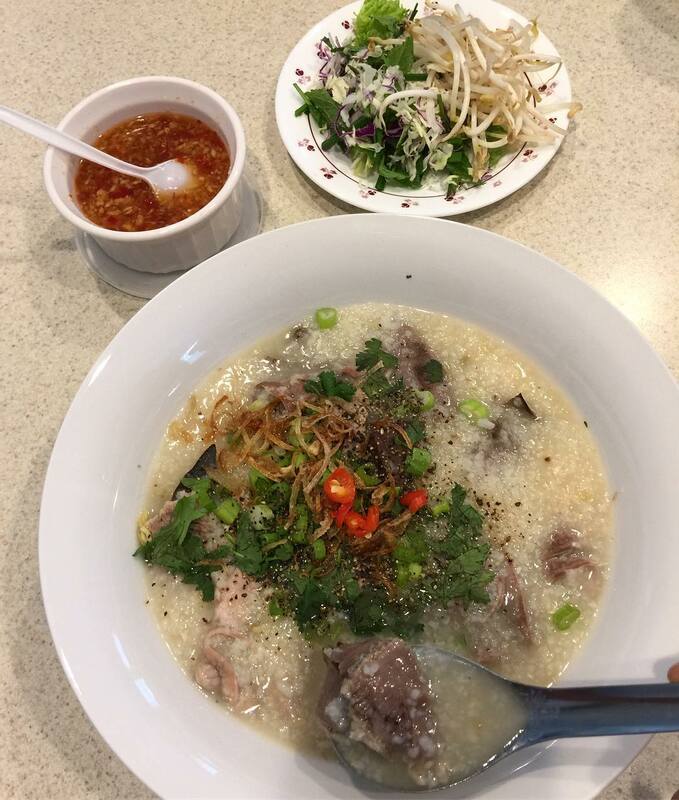 There are several places like 166 Pho Co Dieu or 235 Luong Nhu Hoc. 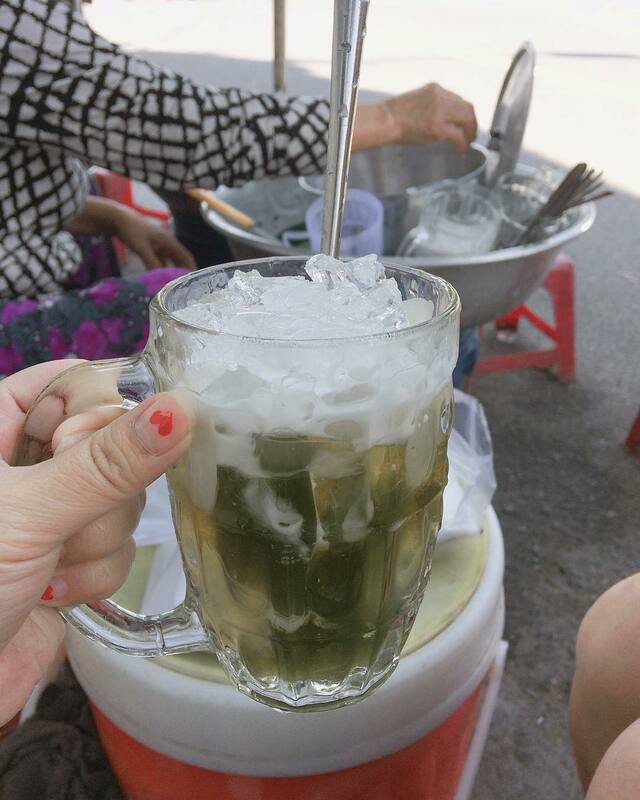 Duc Tac is coconut and kumquat juice, which will surely cool yourself during the hot days in Saigon. 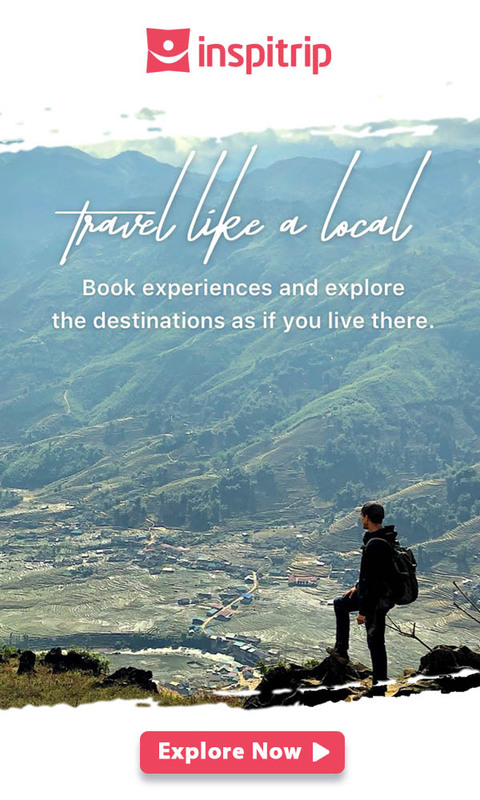 Powered by Inspitrip, an online platform that connects travelers and local insiders for the most authentic travel experience. Wonder if a Mekong Delta day tour is worth it? Read this!